Band "NiЕЎta liДЌno" (Nothing personal) with 12-years old vocalist Anica Cvetkovic will represent Serbia with song "Onaj pravi" (The right one) written by band members Alexandar and Anica. 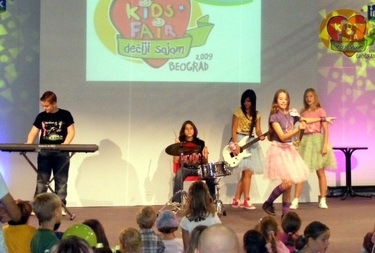 Members of the band "NiЕЎta liДЌno" Anica Cvetkovic and her brother Petar (drums) from Uzice, Sale GraiД‡ (keyboards) from Belgrade, Una KrliД‡ and Karolina Lodi (guitars) from Zrenjanin have experience performing in numerous children's festivals throughout Serbia, Montenegro and Bosnia and Herzegovina: Uzice, Zrenjanin, Pancevo, Novi Sad, Zajecar, Pozega, Banja Luka, Tivat, Rozaje, Bjeloj. But on contrary to being competitors they became friends and some monthes ago have decided to join in one band. 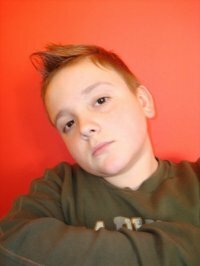 Alexandar (born 08.07.95) is son of Eurovision 2007 winner Molitva composer Vladimir GraiД‡, and Una Krlic (born 27.12.93) is sister of Betty Boop singer Tara Krlic. 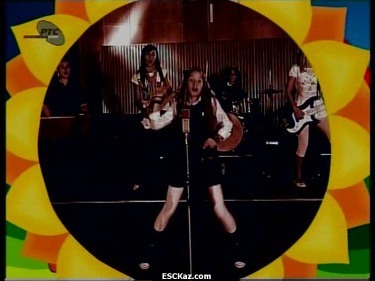 Karolina Lodi took part in JESC 2007 preselection with "Koliko je sati" written by Una Krlic, who also was guitarist and backing vocalist in the performance, finishing 4th. Anica Cvetkovic (born 21.11.96) is seventh grade student of elementary school Dusan Jerkovic, singing is engaged in three years. She has many children's festivals in Uzice, Zajecar, Zrenjanin, Banja Luka, Zlatibor, Pozega, Sochi. 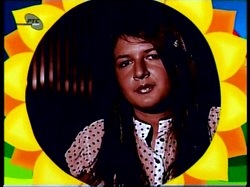 Anica CvetkoviД‡ was born on the 21st of November in 1996 in the town of UЕѕice in central Serbia. She is a seventh grade student of the DuЕЎan JerkoviД‡ elementary school in UЕѕice, having completed all the previous grades with maximum rating. At the UЕѕice Children's Festival Love is our Planet, held in March 2007, she competed for the first time with the song Sweet Sorrows, winning the best interpretation award. This debut was followed by appearances in events held in Banja Luka, on Mt. Zlatibor, in ZajeДЌar and in PoЕѕega (Serbia), winning regularly both awards and the sympathies of the audience. At the initiative and with the sponsorship of the Lira Organisation for Children's Art based in UЕѕice, her first solo CD was published. 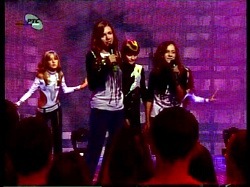 In February 2009, Anica took part in the International Children's Festival of Pop Music held in Sochy (Russia), winning the third place. In March 2009, at the Festival in UЕѕice, she was awarded the prestigious Prize for Contribution to the Development of Children's Art. This was followed by numerous appearances at events for children in Belgrade, Subotica, and her native UЕѕice. For the past five years, Anica has been attending the Scena acting school at the National Theater in UЕѕice. 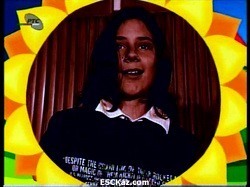 She has been playing several roles in various plays, and hosted a number of children's events. 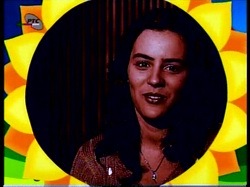 She has sung on radio, shot some TV commercials, as well as a video-clip for her song Pravila (Rules). Between the age of six and eleven she has actively practiced rhythmic gymnastics and dance, and having taken part in a number of competitions, she has scored significant results in this field. 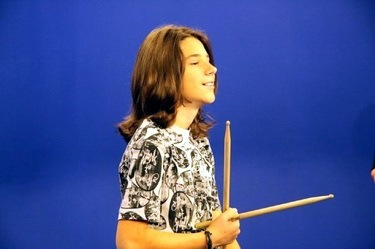 Aleksandar GraiД‡ was born in Belgrade on the 8th of July 1995, in a family of professional musicians. He was a little rascal and before going to school he despised food and all that had anything to do with eating. In time he has grown to like eating. Currently, he is in a phase of adoring it, Italian cuisine in particular! For the past three years he has been attending acting classes. 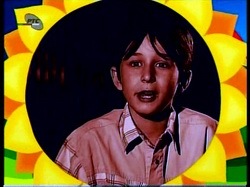 By now, he has appeared in two TV clips. He adores sports, and at his leisure time he plays tennis. He is very much attached to his computer. If he's not on Facebook, then it's YouTube he's surfing. His favorite video games are the ones featuring sports, primarily tennis, soccer and American wrestling. He adores listening to music - at high volume, naturally. Among the older performers his favorites are Led Zeppelin and Survival, and among the newer ones Robbie Williams and Katy Perry. He is a great fan of musical festivals and is a goldmine of diverse pieces of information about them. He likes reading and all he can lay his hands on, for that matter. 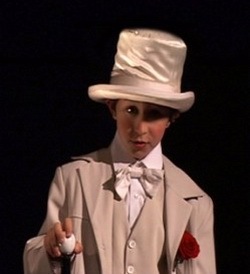 He composed his first song at the age of six, and it was entitled The Sun Setting Beyond the Roof. From that moment on, he hasn't stopped writing about all sorts of thing including bunnies, teddy bears, chocolate covered corn flakes and even his school. 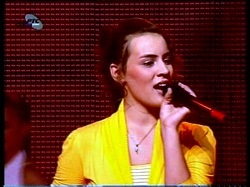 Karolina Lodi was born in Zrenjanin, on 17th of January, 1995. 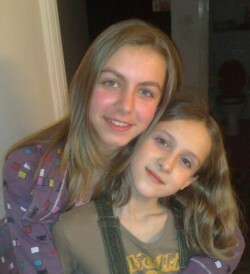 She is in the eighth grade of the Jovan Ducic Elementary School in Klek. She learned the first songs from her grandparents who listened to the old Hungarian folk songs. Her mother taught her the notes. 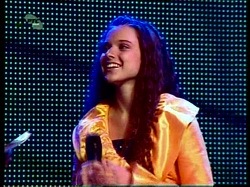 In 2005, Karolina made her first performance at the Sveti Sava Festival in Zrenjanin. She has participated in various national and international children's festivals. Karolina started practicing karate nine years ago. She likes animals and pretty dolls. 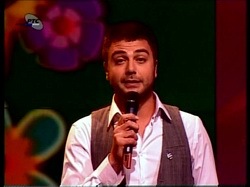 SaЕЎa, the author of the music and co-author of the lyrics for the song Onaj Pravi practically had a finished song that he premiered to his father. Quite pleased with what he heard, his dad sent the recording to a friend of his - Una's father in Zrenjanin. When Una heard the song she immediately sang it to her childhood friend Karolina. Very much enthused Karolina called up her friend Anica from UЕѕice, who happened to be in the company of her brother Petar on the occasion. They were all so thrilled! Anica added some "female subtlety" to SaЕЎa's lyrics, and sent them back to him right away. SaЕЎa reacted by inviting the entire team for a meeting in Belgrade. 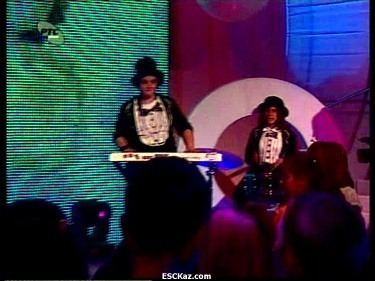 This brought the spontaneous idea of forming a band, because they had personally seen nothing similar before in Serbia. There came up the issue of choosing a name. They thought about it long and hard. After a while, SaЕЎa said: "What do you say we call ourselves - Nothing Personal?вЂњ They all like to point out they became involved in the whole project for the sake of meeting more frequently and having loads of fun, making the time for it between their numerous obligations at school. "Sasa has proposed to start a band and sign up for the competition. He wrote the music and text, in which I helped him a little. We met on the weekends in Belgrade, during the week we had a rehearsal at home. We had to work a lot, but now we have to work three times more to prepare for Kiev", says Anica. "Song "Onaj pravi" is mid-tempo piece, there are a lot of instruments on stage and to someone it can remind by it's rhythm song of Kathy Perry "I Kissed a Girl", and on stage Anica and I will try to somehow adapt Kathy's stage behaviour", describes song author Sale Graic. "Our song is very melodical and talks about the first and true love that happens suddenly and is remembered for the whole life, at least people say so", expains Anica. Speaking after winning national preselection Anica Cvetkovic told that she believes in their chances winning the competition. 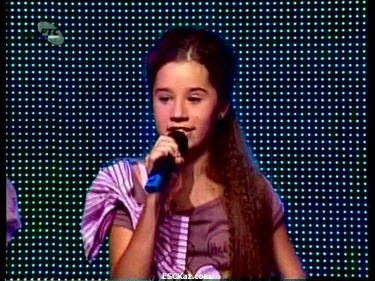 On Arandjelovdan, 21st of November singer will celebrate her 13th birthday. "I think our main rival is participant from Russia. However, I hope we will win and have triple celebration". 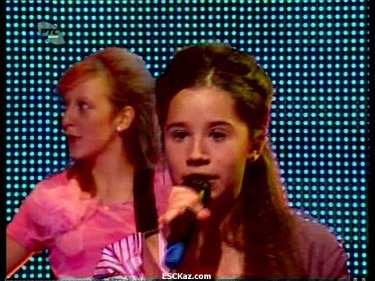 She admitted that was a bit nervous during the national final "This happened for the first time in my life. But thankfully we didn't make any mistakes. Band is the biggest responsibility I have so I gave my best to succeed. We were really hoping to win!" Join promotional page for the band in Facebook. Dragoljub Ilic will be commentator of Serbian RTS at the contest, while votes will be read out by Nevena Bozovic, Serbian representative at JESC 2007. Р“СЂСѓРїРїР° "РќРёС€С‚Р° Р»РёС‡РЅРѕ" (РќРёС‡РµРіРѕ Р»РёС‡РЅРѕРіРѕ) СЃ 12-Р»РµС‚РЅРµР№ РІРѕРєР°Р»РёСЃС‚РєРѕР№ РђРЅРёС†РѕР№ Р¦РІРµС‚РєРѕРІРёС‡ РїСЂРµРґСЃС‚Р°РІРёС‚ РЎРµСЂР±РёСЋ РЅР° Р”РµС‚СЃРєРѕРј Р•РІСЂРѕРІРёРґРµРЅРёРё СЃ РїРµСЃРЅРµР№ "РћРЅР°Р№ РїСЂР°РІРё", Р°РІС‚РѕСЂРѕРј РєРѕС‚РѕСЂРѕР№ СЏРІР»СЏСЋС‚СЃСЏ СѓС‡Р°СЃС‚РЅРёРєРё РіСЂСѓРїРїС‹ РђР»РµРєСЃР°РЅРґР°СЂ Рё РђРЅРёС†Р°. РЈС‡Р°СЃС‚РЅРёРєРё РіСЂСѓРїРїС‹ "РќРёС€С‚Р° Р»РёС‡РЅРѕ" РђРЅРёС†Р° Р¦РІРµС‚РєРѕРІРёС‡ Рё РµРµ Р±СЂР°С‚ РџРµС‚Р°СЂ (СѓРґР°СЂРЅС‹Рµ) РёР· РЈР¶РёС†Рµ, РЎР°Р»Рµ Р“СЂР°РёС‡ (РєР»Р°РІРёС€РЅС‹Рµ) РёР· Р‘РµР»РіСЂР°РґР°, РЈРЅР° РљСЂР»РёС‡ Рё РљР°СЂРѕР»РёРЅР° Р›РѕРґРё (РіРёС‚Р°СЂС‹) РёР· Р—СЂРµРЅСЊСЏРЅРёРЅР° РёРјРµСЋС‚ Р±РѕР»СЊС€РѕР№ РѕРїС‹С‚ РІС‹СЃС‚СѓРїР»РµРЅРёР№ РЅР° СЂР°Р·Р»РёС‡РЅС‹С… РґРµС‚СЃРєРёС… С„РµСЃС‚РёРІР°Р»СЏС… РІ РЎРµСЂР±РёРё, Р§РµСЂРЅРѕРіРѕСЂРёРё Рё Р‘РѕСЃРЅРёРё Рё Р“РµСЂС†РµРіРѕРІРёРЅРµ: РІ РЈР¶РёС†Рµ, Р—СЂРµРЅСЊСЏРЅРёРЅРµ, РџР°РЅС‡РµРІРѕ, РќРѕРІРё РЎР°РґРµ, Р—Р°Р№РµС‡Р°СЂРµ, РџРѕР¶РµРіРµ, Р‘Р°РЅСЊРµ Р›СѓРєРµ, РўРёРІС‚Рµ, Р РѕР¶Р°Р№Рµ, Р‘Р№РµР»РѕР№. РќРѕ РІРјРµСЃС‚Рѕ С‚РѕРіРѕ, С‡С‚РѕР±С‹ РѕСЃС‚Р°РІР°С‚СЊСЃСЏ СЃРѕРїРµСЂРЅРёРєР°РјРё, РѕРЅРё РїРѕРґСЂСѓР¶РёР»РёСЃСЊ Рё РЅРµСЃРєРѕР»СЊРєРѕ РјРµСЃСЏС†РµРІ РЅР°Р·Р°Рґ СЂРµС€РёР»Рё РѕР±СЉРµРґРёРЅРёС‚СЊСЃСЏ РІ РѕРґРЅСѓ РіСЂСѓРїРїСѓ. РђР»РµРєСЃР°РЅРґР°СЂ (СЂРѕРґРёР»СЃСЏ 08.07.95) - СЃС‹РЅ Р°РІС‚РѕСЂР° РїРµСЃРЅРё-РїРѕР±РµРґРёС‚РµР»СЊРЅРёС†С‹ Р•РІСЂРѕРІРёРґРµРЅРёСЏ 2007 "РњРѕР»РёС‚РІР°" Р’Р»Р°РґРёРјРёСЂР° Р“СЂР°РёС‡Р°, РЈРЅР° РљСЂР»РёС‡ (СЂРѕРґРёР»Р°СЃСЊ 27.12.93) - СЃРµСЃС‚СЂР° СЃРѕР»РёСЃС‚РєРё РіСЂСѓРїРїС‹ Betty Boop РўР°СЂС‹ РљСЂР»РёС‡. РљР°СЂРѕР»РёРЅР° Р›РѕРґРё РїСЂРёРЅРёРјР°Р»Р° СѓС‡Р°СЃС‚РёРµ РІ РѕС‚Р±РѕСЂРµ 2007 РіРѕРґР° СЃ РїРµСЃРЅРµР№ "Koliko je sati", РЅР°РїРёСЃР°РЅРЅРѕР№ РЈРЅРѕР№ РљСЂР»РёС‡, РєРѕС‚РѕСЂР°СЏ С‚Р°РєР¶Рµ Р±С‹Р»Р° РіРёС‚Р°СЂРёСЃС‚РєРѕР№ Рё Р±СЌРє-РІРѕРєР°Р»РёСЃС‚РєРѕР№ РІ СЌС‚РѕРј РІС‹СЃС‚СѓРїР»РµРЅРёРё, Р·Р°РЅСЏРІ 4Рµ РјРµСЃС‚Рѕ. РђРЅРёС†Р° Р¦РІРµС‚РєРѕРІРёС‡ СЂРѕРґРёР»Р°СЃСЊ 21РіРѕ РЅРѕСЏР±СЂСЏ 1996 РіРѕРґР° РІ РіРѕСЂРѕРґРµ РЈР¶РёС†Рµ СЃ С†РµРЅС‚СЂР°Р»СЊРЅРѕР№ РЎРµСЂР±РёРё. РЎРµР№С‡Р°СЃ РѕРЅР° СѓС‡РёС‚СЃСЏ РІ 7Рј РєР»Р°СЃСЃРµ СЃСЂРµРґРЅРµР№ С€РєРѕР»С‹ РёРј.Р”СѓС€Р°РЅР° Р™РµСЂРєРѕРІРёС‡Р°, Р·Р°РєРѕРЅС‡РёРІ РІСЃРµ РїСЂРµРґС‹РґСѓС‰РёРµ РєР»Р°СЃСЃС‹ РЅР° РѕС‚Р»РёС‡РЅРѕ. РќР° РґРµС‚СЃРєРѕРј С„РµСЃС‚РёРІР°Р»Рµ "Р›СЋР±РѕРІСЊ - РЅР°С€Р° РџР»Р°РЅРµС‚Р°" РІ РЈР¶РёС†Рµ РІ РјР°СЂС‚Рµ 2007 РіРѕРґР° РѕРЅР° РІРїРµСЂРІС‹Рµ РІС‹СЃС‚СѓРїРёР»Р°, РёСЃРїРѕР»РЅРёРІ РїРµСЃРЅСЋ "Sweet sorrows" Рё Р·Р°РІРѕРµРІР°РІ РїСЂРёР· Р·Р° Р»СѓС‡С€РµРµ РёСЃРїРѕР»РЅРµРЅРёРµ. Р—Р° СЌС‚РёРј РґРµР±СЋС‚РѕРј РїРѕСЃР»РµРґРѕРІР°Р»Рё РІС‹СЃС‚СѓРїР»РµРЅРёСЏ РІ Р‘Р°РЅСЊРµ Р›СѓРєРµ, Р—Р»Р°С‚РёР±РѕСЂРµ, Р—Р°Р№РµС‡Р°СЂРµ Рё РІ РџРѕР¶РµРіРµ (РЎРµСЂР±РёСЏ), РіРґРµ РѕРЅР° РїСЂРѕРґРѕР»Р¶РёР»Р° Р·Р°РІРѕРµРІС‹РІР°С‚СЊ РЅР°РіСЂР°РґС‹ Рё СЃРёРјРїР°С‚РёРё Р·СЂРёС‚РµР»СЊСЃРєРѕР№ Р°СѓРґРёС‚РѕСЂРёРё. РџРѕ РёРЅРёС†РёР°С‚РёРІРµ Рё РїСЂРё СЃРїРѕРЅСЃРѕСЂСЃРєРѕР№ РїРѕРґРґРµСЂР¶РєРµ РґРµС‚СЃРєРѕР№ С…СѓРґРѕР¶РµСЃС‚РІРµРЅРЅРѕР№ РѕСЂРіР°РЅРёР·Р°С†РёРё Р›РёСЂР° РёР· РµРµ СЂРѕРґРЅРѕРіРѕ РіРѕСЂРѕРґР°, РѕРЅР° РІС‹РїСѓСЃС‚РёР»Р° СЃРІРѕР№ РїРµСЂРІС‹Р№ СЃРѕР»СЊРЅС‹Р№ Р°Р»СЊР±РѕРј. Р’ С„РµРІСЂР°Р»Рµ 2009 РіРѕРґР° РђРЅРёС†Р° РїСЂРёРЅСЏР»Р° СѓС‡Р°СЃС‚РёРµ РІ РјРµР¶РґСѓРЅР°СЂРѕРґРЅРѕРј РґРµС‚СЃРєРѕРј РјСѓР·С‹РєР°Р»СЊРЅРѕРј С„РµСЃС‚РёРІР°Р»Рµ РІ РіРѕСЂРѕРґРµ РЎРѕС‡Рё, Р РѕСЃСЃРёСЏ, Р·Р°РІРѕРµРІР°РІ С‚СЂРµС‚СЊСЋ РїСЂРµРјРёСЋ. Р’ РјР°СЂС‚Рµ 2009, РЅР° С„РµСЃС‚РёРІР°Р»Рµ РІ РЈР¶РёС†Рµ, РѕРЅР° РїРѕР»СѓС‡РёР»Р° РїСЂРµСЃС‚РёР¶РЅС‹Р№ РїСЂРёР· Р·Р° Р’РєР»Р°Рґ РІ СЂР°Р·РІРёС‚РёРµ РґРµС‚СЃРєРѕРіРѕ РёСЃРєСѓСЃСЃС‚РІР°. Р—Р° СЌС‚РёРј РїРѕСЃР»РµРґРѕРІР°Р»Рё РЅРµСЃРєРѕР»СЊРєРѕ РІС‹СЃС‚СѓРїР»РµРЅРёР№ РЅР° РґРµС‚СЃРєРёС… РјРµСЂРѕРїСЂРёСЏС‚РёСЏС… РІ Р‘РµР»РіСЂР°РґРµ, РЎСѓР±РѕС‚РёС†Рµ Рё РµРµ СЂРѕРґРЅРѕРј РіРѕСЂРѕРґРµ. РџРѕСЃР»РµРґРЅРёРµ РїСЏС‚СЊ Р»РµС‚ РђРЅРёС†Р° Р·Р°РЅРёРјР°РµС‚СЃСЏ РІ С€РєРѕР»Рµ СЃС†РµРЅРёС‡РµСЃРєРѕРіРѕ РёСЃРєСѓСЃСЃС‚РІР° РїСЂРё РЅР°С†РёРѕРЅР°Р»СЊРЅРѕРј С‚РµР°С‚СЂРµ РЈР¶РёС†Рµ. РћРЅР° РёСЃРїРѕР»РЅСЏР»Р° РЅРµСЃРєРѕР»СЊРєРѕ СЂРѕРґРµР№ РІ С‚РµР°С‚СЂР°Р»СЊРЅС‹С… РїРѕСЃС‚Р°РЅРѕРІРєР°С… Рё Р±С‹Р»Р° РІРµРґСѓС‰РµР№ СЂСЏРґР° РґРµС‚СЃРєРёС… РјРµСЂРѕРїСЂРёСЏС‚РёР№. РћРЅР° С‚Р°РєР¶Рµ РїРµР»Р° РЅР° СЂР°РґРёРѕ, СЃРЅРёРјР°Р»Р°СЃСЊ РІ СЂРµРєР»Р°РјРµ, Р° С‚Р°РєР¶Рµ СЃРЅСЏР»Р° РєР»РёРї РЅР° СЃРІРѕСЋ РїРµСЃРЅСЋ РџСЂР°РІРёР»Р°. РЎ 6 РґРѕ 11 Р»РµС‚ РѕРЅР° Р°РєС‚РёРІРЅРѕ Р·Р°РЅРёРјР°Р»Р°СЃСЊ СЂРёС‚РјРёС‡РµСЃРєРѕР№ РіРёРјРЅР°СЃС‚РёРєРѕР№ Рё РїСЂРёРЅРёРјР°Р»Р° СѓС‡Р°СЃС‚РёРµ РІ СЂР°Р·Р»РёС‡РЅС‹С… СЃРѕСЂРµРІРЅРѕРІР°РЅРёСЏС…, РґРѕСЃС‚РёРіРЅСѓРІ СѓСЃРїРµС…Р° Рё РІ СЌС‚РѕР№ РѕР±Р»Р°СЃС‚Рё. РђР»РµРєСЃР°РЅРґСЂ Р“СЂР°РёС‡ СЂРѕРґРёР»СЃСЏ РІ Р‘РµР»РіСЂР°РґРµ, 8РіРѕ РёСЋР»СЏ 1995 РіРѕРґР°, РІ СЃРµРјСЊРµ РїСЂРѕС„РµСЃСЃРёРѕРЅР°Р»СЊРЅС‹С… РјСѓР·С‹РєР°РЅС‚РѕРІ. Р’ РґРµС‚СЃС‚РІРµ РѕРЅ РѕС‡РµРЅСЊ РЅРµ Р»СЋР±РёР» РµРґСѓ Рё РІСЃРµ, С‡С‚Рѕ СЃРІСЏР·Р°РЅРѕ СЃ РїСЂРѕРґРѕРІРѕР»СЊСЃС‚РІРёРµРј. РћРґРЅР°РєРѕ, СЃ РІРѕР·СЂР°СЃС‚РѕРј РѕРЅ СЃС‚Р°Р» РЅР°СЃС‚РѕСЏС‰РёРј РіСѓСЂРјР°РЅРѕРј. Р’ РЅР°СЃС‚РѕСЏС‰РµРµ РІСЂРµРјСЏ РѕРЅ РїСЂРѕСЃС‚Рѕ РѕР±РѕР¶Р°РµС‚ РїРѕРµСЃС‚СЊ, РІ С‡Р°СЃС‚РЅРѕСЃС‚Рё РёС‚Р°Р»СЊСЏРЅСЃРєСѓСЋ РєСѓС…РЅСЋ! Р’ РїРѕСЃР»РµРґРЅРёРµ С‚СЂРё РіРѕРґР° РѕРЅ РїРѕСЃРµС‰Р°Р» СѓСЂРѕРєРё Р°РєС‚РµСЂСЃРєРѕРіРѕ РјР°СЃС‚РµСЂСЃС‚РІР°. Р”Рѕ СЃРµРіРѕРґРЅСЏС€РЅРµРіРѕ РґРЅСЏ РѕРЅ СЃРЅСЏР»СЃСЏ РІ РґРІСѓС… С‚РµР»РµРІРёР·РёРѕРЅРЅС‹С… РєР»РёРїРѕРІ. РћРЅ РѕР±РѕР¶Р°РµС‚ СЃРїРѕСЂС‚, Рё РІ СЃРІРѕР±РѕРґРЅРѕРµ РІСЂРµРјСЏ РѕРЅ РёРіСЂР°РµС‚ РІ С‚РµРЅРЅРёСЃ. РћРЅ РѕС‡РµРЅСЊ РїСЂРёРІСЏР·Р°РЅ Рє СЃРІРѕРµРјСѓ РєРѕРјРїСЊСЋС‚РµСЂСѓ. Р•СЃР»Рё РѕРЅ РЅРµ РЅР° Facebook, С‚Рѕ РѕРЅ РѕР±С‹С‡РЅРѕ РЅР° YouTube. Р•РіРѕ Р»СЋР±РёРјС‹Рµ РІРёРґРµРѕРёРіСЂС‹ - СЃРёРјСѓР»СЏСЂРѕС‚С‹ СЃРїРѕСЂС‚Р°, РїСЂРµР¶РґРµ РІСЃРµРіРѕ С‚РµРЅРЅРёСЃ, С„СѓС‚Р±РѕР» Рё Р°РјРµСЂРёРєР°РЅСЃРєР°СЏ Р±РѕСЂСЊР±Р°. РћРЅ РѕР±РѕР¶Р°РµС‚ СЃР»СѓС€Р°С‚СЊ РјСѓР·С‹РєСѓ - РЅР° РІС‹СЃРѕРєРѕР№ РіСЂРѕРјРєРѕСЃС‚Рё, РµСЃС‚РµСЃС‚РІРµРЅРЅРѕ. РЎСЂРµРґРё СЃС‚Р°СЂС‹С… РёСЃРїРѕР»РЅРёС‚РµР»РµР№ РµРіРѕ Р»СЋР±РёРјС‹РјРё СЏРІР»СЏСЋС‚СЃСЏ Led Zeppelin Рё Survival, Р° СЃСЂРµРґРё Р±РѕР»РµРµ РЅРѕРІС‹С… Р РѕР±Р±Рё РЈРёР»СЊСЏРјСЃ Рё РљСЌС‚Рё РџРµСЂСЂРё. РћРЅ - Р±РѕР»СЊС€РѕР№ РїРѕРєР»РѕРЅРЅРёРє РјСѓР·С‹РєР°Р»СЊРЅС‹С… С„РµСЃС‚РёРІР°Р»РµР№ Рё РєР»Р°РґРµР·СЊ СЂР°Р·Р»РёС‡РЅРѕР№ РёРЅС„РѕСЂРјР°С†РёРё Рѕ РЅРёС…. РћРЅ Р»СЋР±РёС‚ С‡РёС‚Р°С‚СЊ Рё С‡РёС‚Р°РµС‚ РІСЃРµ, С‡С‚Рѕ РїРѕРїР°РґР°РµС‚ РµРјСѓ РІ СЂСѓРєРё. РћРЅ РЅР°РїРёСЃР°Р» СЃРІРѕСЋ РїРµСЂРІСѓСЋ РїРµСЃРЅСЋ РІ РІРѕР·СЂР°СЃС‚Рµ С€РµСЃС‚Рё Р»РµС‚, Рё РѕРЅР° РЅР°Р·С‹РІР°Р»Р°СЃСЊ "РЎРѕР»РЅС†Рµ, Р·Р°С…РѕРґСЏС‰РµРµ Р·Р° РєСЂС‹С€Сѓ". РЎ СЌС‚РѕРіРѕ РјРѕРјРµРЅС‚Р°, РѕРЅ РЅРµ РїРµСЂРµСЃС‚Р°РІР°Р» РїРёСЃР°С‚СЊ Рѕ СЂР°Р·РЅС‹С… РІРµС‰Р°С…, РІРєР»СЋС‡Р°СЏ Р·Р°Р№С‡РёРєРѕРІ, РјРµРґРІРµР¶Р°С‚, РїРѕРєСЂС‹С‚С‹Рµ С€РѕРєРѕР»Р°РґРѕРј РєСѓРєСѓСЂСѓР·РЅС‹С… С…Р»РѕРїСЊСЏС… Рё РґР°Р¶Рµ Рѕ СЃРІРѕРµР№ С€РєРѕР»Рµ. РљР°СЂРѕР»РёРЅР° Р›РѕРґРё СЂРѕРґРёР»Р°СЃСЊ РІ Р—СЂРµРЅСЊСЏРЅРёРЅРµ 17 СЏРЅРІР°СЂСЏ 1995 РіРѕРґР°. РЎРµР№С‡Р°СЃ РѕРЅР° СѓС‡РёС‚СЃСЏ РІ 8Рј РєР»Р°СЃСЃРµ С€РєРѕР»С‹ Р™РѕРІР°РЅР° Р”СѓС‡РёС‡Р° РІ РљР»РµРєРµ. РџРµСЂРІС‹Рј РїРµСЃРЅСЏРј РѕРЅР° РЅР°СѓС‡РёР»Р°СЃСЊ РѕС‚ СЃРІРѕРёС… РґРµРґСѓС€РєРё СЃ Р±Р°Р±СѓС€РєРѕР№, РєРѕС‚РѕСЂС‹Рµ Р»СЋР±РёР»Рё СЃР»СѓС€Р°С‚СЊ РІРµРЅРіРµСЂСЃРєРёРµ С„РѕР»СЊРєР»РѕСЂРЅС‹Рµ РїРµСЃРЅРё, Р° РјР°РјР° РЅР°СѓС‡РёР»Р° РµРµ РЅРѕС‚Р°Рј. Р’ 2005 РіРѕРґСѓ РљР°СЂРѕР»РёРЅР° РґРµР±СЋС‚РёСЂРѕРІР°Р»Р° РЅР° С„РµСЃС‚РёРІР°Р»Рµ Sveti Sava РІ Р—СЂРµРЅСЊСЏРЅРёРЅРµ. РћРЅР° СѓС‡Р°СЃС‚РІРѕРІР°Р»Р° РІ СЂР°Р·Р»РёС‡РЅС‹С… РЅР°С†РёРѕРЅР°Р»СЊРЅС‹С… Рё РјРµР¶РґСѓРЅР°СЂРѕРґРЅС‹С… РґРµС‚СЃРєРёС… С„РµСЃС‚РёРІР°Р»СЏС…. Р”РµРІСЏС‚СЊ Р»РµС‚ РЅР°Р·Р°Рґ РљР°СЂРѕР»РёРЅР° РЅР°С‡Р°Р»Р° Р·Р°РЅРёРјР°С‚СЊСЃСЏ РєР°СЂР°С‚Рµ. РћРЅР° Р»СЋР±РёС‚ Р¶РёРІРѕС‚РЅС‹С… Рё РєСЂР°СЃРёРІС‹Рµ РєСѓРєР»С‹. РЎР°С€Р°, Р°РІС‚РѕСЂ РјСѓР·С‹РєРё Рё С‚РµРєСЃС‚Р° РїРµСЃРЅРё Onaj Pravi РїРѕРєР°Р·Р°Р» РїСЂР°РєС‚РёС‡РµСЃРєРё РіРѕС‚РѕРІСѓСЋ РїРµСЃРЅСЋ СЃРІРѕРµРјСѓ РѕС‚С†Сѓ. РўРѕРјСѓ РїРѕРЅСЂР°РІРёР»Р°СЃСЊ РєРѕРјРїРѕР·РёС†РёСЏ Рё РѕРЅР° РѕС‚РїСЂР°РІРёР» РµРµ СЃРІРѕРµРјСѓ РґСЂСѓРіСѓ - РѕС‚С†Сѓ РЈРЅС‹ РІ Р—СЂРµРЅСЊСЏРЅРёРЅ. РљРѕРіРґР° РЈРЅР° СѓСЃР»С‹С€Р°Р»Р° РїРµСЃРЅСЋ, С‚Рѕ СЃСЂР°Р·Сѓ Р¶Рµ СЃРїРµР»Р° РµРµ СЃРІРѕРµР№ РїРѕРґСЂСѓРіРµ РґРµС‚СЃС‚РІР° РљР°СЂРѕР»РёРЅРµ. РљР°СЂРѕР»РёРЅР° РїРѕР·РІРѕРЅРёР»Р° СЃРІРѕРµР№ РїРѕРґСЂСѓРіРµ РђРЅРёС†Рµ РёР· РЈР¶РёС†Рµ, РєРѕС‚РѕСЂР°СЏ РєР°Рє СЂР°Р· Р±С‹Р»Р° СЃРѕ СЃРІРѕРёРј Р±СЂР°С‚РѕРј РџРµС‚Р°СЂРѕРј. Р’СЃРµРј РёРј РѕС‡РµРЅСЊ РїРѕРЅСЂР°РІРёР»Р°СЃСЊ РїРµСЃРЅСЏ! РђРЅРёС†Р° РґРѕР±Р°РІРёР»Р° "Р¶РµРЅСЃС‚РІРµРЅРЅРѕСЃС‚Рё" РІ С‚РµРєСЃС‚ РЎР°С€Рё Рё С‚СѓС‚ Р¶Рµ РѕС‚РѕСЃР»Р°Р»Р° РµРіРѕ РµРјСѓ РѕР±СЂР°С‚РЅРѕ. РЎР°С€Р° РїСЂРёРіР»Р°СЃРёР» РІСЃСЋ РєРѕРјР°РЅРґСѓ РЅР° РІСЃС‚СЂРµС‡Сѓ РІ Р‘РµР»РіСЂР°Рґ. РўР°Рј РІРѕР·РЅРёРєР»Р° СЃРїРѕРЅС‚Р°РЅРЅР°СЏ РёРґРµСЏ СЃРѕР·РґР°РЅРёСЏ РіСЂСѓРїРїС‹, РїРѕСЃРєРѕР»СЊРєСѓ РѕРЅРё Р»РёС‡РЅРѕ РЅРёС‡РµРіРѕ СЂР°РЅСЊС€Рµ РІ РЎРµСЂР±РёРё РїРѕРґРѕР±РЅРѕРіРѕ РЅРµ РІРёРґРµР»Рё. Р’РѕР·РЅРёРє РІРѕРїСЂРѕСЃ Рѕ РЅР°Р·РІР°РЅРёРё РіСЂСѓРїРїС‹, РєРѕС‚РѕСЂС‹Р№ РЅР°РїСЂСЏР¶РµРЅРЅРѕ Рё РґРѕР»РіРѕ РѕР±РґСѓРјС‹РІР°Р»СЃСЏ. РЎРїСѓСЃС‚СЏ РЅРµРєРѕС‚РѕСЂРѕРµ РІСЂРµРјСЏ РЎР°С€Р° СЃРєР°Р·Р°Р»: "РљР°Рє РІС‹ РіРѕРІРѕСЂРёС‚Рµ РјС‹ СЃРµР±СЏ РЅР°Р·С‹РІР°РµРј - РќРёС‡РµРіРѕ Р»РёС‡РЅРѕРіРѕ?". Р§Р»РµРЅС‹ РіСЂСѓРїРїС‹ РіРѕРІРѕСЂСЏС‚, С‡С‚Рѕ СЃРѕРіР»Р°СЃРёР»РёСЃСЊ РЅР° СѓС‡Р°СЃС‚РёРµ РІ РїСЂРѕРµРєС‚Рµ РїСЂРµР¶РґРµ РІСЃРµРіРѕ РґР»СЏ С‚РѕРіРѕ, С‡С‚РѕР±С‹ С‡Р°С‰Рµ РІСЃС‚СЂРµС‡Р°С‚СЊСЃСЏ Рё РІРµСЃРµР»Рѕ РїСЂРѕРІРѕРґРёС‚СЊ РІСЂРµРјСЏ РјРµР¶РґСѓ РёС… С€РєРѕР»СЊРЅС‹РјРё Р·Р°РЅСЏС‚РёСЏРјРё. "РЎР°С€Р° РїСЂРµРґР»РѕР¶РёР» РЅР°Рј СЃРѕР·РґР°С‚СЊ РіСЂСѓРїРїСѓ Рё РїРѕРґР°С‚СЊ Р·Р°СЏРІРєСѓ РЅР° РєРѕРЅРєСѓСЂСЃ. РћРЅ РЅР°РїРёСЃР°Р» РјСѓР·С‹РєСѓ Рё С‚РµРєСЃС‚, РІ РєРѕС‚РѕСЂРѕРј СЏ РµРјСѓ РЅРµРјРЅРѕРіРѕ РїРѕРјРѕРіР»Р°. РњС‹ РІСЃС‚СЂРµС‚РёР»РёСЃСЊ РїРѕ РІС‹С…РѕРґРЅС‹Рј РІ Р‘РµР»РіСЂР°РґРµ, Рё РЅР° СЌС‚РѕР№ РЅРµРґРµР»Рµ СЂРµРїРµС‚РёСЂРѕРІР°Р»Рё РґРѕРјР°. РџСЂРёС€Р»РѕСЃСЊ РјРЅРѕРіРѕ РїРѕСЂР°Р±РѕС‚Р°С‚СЊ, РЅРѕ РїРµСЂРµРґ РљРёРµРІРѕРј РїСЂРёРґРµС‚СЃСЏ СЂР°Р±РѕС‚Р°С‚СЊ РІ С‚СЂРё СЂР°Р·Р° Р±РѕР»СЊС€Рµ", РіРѕРІРѕСЂРёС‚ РђРЅРёС†Р°. "РџРµСЃРЅСЏ "РћРЅР°Р№ РїСЂР°РІРё" - СЃСЂРµРґРЅРµС‚РµРјРїРѕРІР°СЏ РєРѕРјРїРѕР·РёС†РёСЏ, РЅР° СЃС†РµРЅРµ Р±СѓРґРµС‚ РјРЅРѕРіРѕ РёРЅСЃС‚СЂСѓРјРµРЅС‚РѕРІ, Рё РєРѕРјСѓ-С‚Рѕ РїРѕ СЃРІРѕРµРјСѓ СЂРёС‚РјСѓ РѕРЅР° РјРѕР¶РµС‚ РЅР°РїРѕРјРЅРёС‚СЊ РїРµСЃРЅСЋ РљРµС‚Рё РџРµСЂСЂРё "I Kissed a Girl". РќР° СЃС†РµРЅРµ СЏ Рё РђРЅРёС†Р° РїРѕРїСЂРѕР±СѓРµРј РІРѕРїР»РѕС‚РёС‚СЊ СЃС†РµРЅРёС‡РµСЃРєРѕРµ РїРѕРІРµРґРµРЅРёРµ РљРµС‚Рё", РѕРїРёСЃС‹РІР°РµС‚ РїРµСЃРЅСЋ РµРµ Р°РІС‚РѕСЂ РЎР°Р»Рµ Р“СЂР°РёС‡. "РќР°С€Р° РїРµСЃРЅСЏ - РѕС‡РµРЅСЊ РјРµР»РѕРґРёС‡РЅР°СЏ Рё СЂР°СЃСЃРєР°Р·С‹РІР°РµС‚ Рѕ РїРµСЂРІРѕР№ РЅР°СЃС‚РѕСЏС‰РµР№ Р»СЋР±РІРё, РєРѕС‚РѕСЂР°СЏ РїСЂРёС…РѕРґРёС‚ РЅРµРѕР¶РёРґР°РЅРЅРѕ Рё РѕСЃС‚Р°РµС‚СЃСЏ РІ РїР°РјСЏС‚Рё РЅР° РІСЃСЋ Р¶РёР·РЅСЊ, РїРѕ РєСЂР°Р№РЅРµР№ РјРµСЂРµ С‚Р°Рє РіРѕРІРѕСЂСЏС‚", РѕР±СЉСЏСЃРЅСЏРµС‚ РђРЅРёС†Р°, Р°РІС‚РѕСЂ С‚РµРєСЃС‚Р° РїРµСЃРЅРё. РџРѕСЃР»Рµ РїРѕР±РµРґС‹ РЅР° РЅР°С†РёРѕРЅР°Р»СЊРЅРѕРј РѕС‚Р±РѕСЂРµ РђРЅРёС†Р° Р¦РІРµС‚РєРѕРІРёС‡ СЂР°СЃСЃРєР°Р·Р°Р»Р°, С‡С‚Рѕ РІРµСЂРёС‚ РІ РёС… С€Р°РЅСЃС‹ РЅР° РїРѕР±РµРґСѓ Рё РЅР° РјРµР¶РґСѓРЅР°СЂРѕРґРЅРѕРј РєРѕРЅРєСѓСЂСЃРµ. Р’ РґРµРЅСЊ СЃРІ. Р°СЂС…Р°РЅРіРµР»Р° РњРёС…Р°РёР»Р°, 21РіРѕ РЅРѕСЏР±СЂСЏ, РїРµРІРёС†Р° РѕС‚РјРµС‚РёС‚ СЃРІРѕР№ 13Р№ РґРµРЅСЊ СЂРѕР¶РґРµРЅРёСЏ. "РЇ РґСѓРјР°СЋ, С‡С‚Рѕ РЅР°С€РёРј РѕСЃРЅРѕРІРЅС‹Рј РєРѕРЅРєСѓСЂРµРЅС‚РѕРј СЏРІР»СЏРµС‚СЃСЏ РїРµРІРёС†Р° РёР· Р РѕСЃСЃРёРё. РћРґРЅР°РєРѕ, СЏ РЅР°РґРµСЋСЃСЊ, С‡С‚Рѕ РјС‹ РїРѕР±РµРґРёРј Рё Сѓ РјРµРЅСЏ Р±СѓРґРµС‚ РїРѕРІРѕРґ РґР»СЏ С‚СЂРѕРµРєСЂР°С‚РЅС‹С… РїСЂР°Р·РґРЅРѕРІР°РЅРёР№". РћРЅР° РїСЂРёР·РЅР°Р»Р°, С‡С‚Рѕ РЅРµРјРЅРѕРіРѕ РЅРµСЂРІРЅРёС‡Р°Р»Р° РІРѕ РІСЂРµРјСЏ РЅР°С†РёРѕРЅР°Р»СЊРЅРѕРіРѕ С„РёРЅР°Р»Р°. "Р­С‚Рѕ РїСЂРѕРёР·РѕС€Р»Рѕ СЃРѕ РјРЅРѕР№ РІРїРµСЂРІС‹Рµ РІ Р¶РёР·РЅРё. РќРѕ, Рє СЃС‡Р°СЃС‚СЊСЋ, РјС‹ РЅРµ РґРѕРїСѓСЃС‚РёР»Рё РєР°РєРёС…-С‚Рѕ РѕС€РёР±РѕРє. Р“СЂСѓРїРїР° - СЌС‚Рѕ РјРѕСЏ СЃР°РјР°СЏ Р±РѕР»СЊС€Р°СЏ РѕС‚РІРµС‚СЃС‚РІРµРЅРЅРѕСЃС‚СЊ Рё СЏ РїРѕСЃС‚Р°СЂР°Р»Р°СЃСЊ РІС‹Р»РѕР¶РёС‚СЊСЃСЏ РїРѕР»РЅРѕСЃС‚СЊСЋ, С‡С‚РѕР±С‹ РґРѕР±РёС‚СЊСЃСЏ СѓСЃРїРµС…Р°. РњС‹ РѕС‡РµРЅСЊ С…РѕС‚РµР»Рё РїРѕР±РµРґРёС‚СЊ!". РџСЂРёСЃРѕРµРґРёРЅСЏР№С‚РµСЃСЊ Рє РїСЂРѕРјРѕ-СЃС‚СЂР°РЅРёС†Рµ РіСЂСѓРїРїС‹ РІ Р¤СЌР№СЃР±СѓРєРµ. Р”СЂР°РіРѕР»СЋР± Р�Р»РёС‡ СЃС‚Р°РЅРµС‚ РєРѕРјРјРµРЅС‚Р°С‚РѕСЂРѕРј РЎРµСЂР±СЃРєРѕРіРѕ Р РўРЎ РЅР° РєРѕРЅРєСѓСЂСЃРµ, Р° РіРѕР»РѕСЃР° РЎРµСЂР±РёРё РѕРіР»Р°СЃРёС‚ РќРµРІРµРЅР° Р‘РѕР·РѕРІРёС‡, РїСЂРµРґСЃС‚Р°РІРёС‚РµР»СЊРЅРёС†Р° РЎРµСЂР±РёРё РЅР° Р”РµС‚СЃРєРѕРј Р•РІСЂРѕРІРёРґРµРЅРёРё 2007. Р”Рѕ СљРµРіР° СЃСѓ РјРµ РґРѕРІРµР»Рµ. РљР°РєРѕ Р·РЅР°С€, РєР°РєРѕ Р·РЅР°С€ С€С‚Р° С�Рµ РѕСЃРµС›Р°С� С‚Р°С�? РљР°РєРѕ Р·РЅР°С€, РєР°РєРѕ Р·РЅР°С€ РґР° С‚Рѕ РЅРёС�Рµ СЃР°РЅ? РћРЅРґР° Р·РЅР°С€ РґР° С�Рµ РѕРЅР°С� РїСЂР°РІРё. Do njega su me dovele. Kako znaЕЎ, kako znaЕЎ ЕЎta je oseД‡aj taj? Kako znaЕЎ, kako znaЕЎ da to nije san? Onda znaЕЎ da je onaj pravi. Tell me more, tell me more, what do you feel? Tell me more, tell me more, is it just a dream? Blushing cheeks each time you call his name? Than you know, it's not a game! 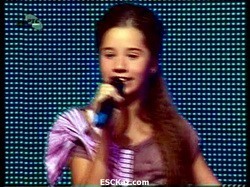 - Hi, NiЕЎta Licno, and first of all our congratulations for winning Serbian national selection! What were your first thoughts when you realized you are the winners of the competition? - Thank you! We didn't expect to win, so we were surprised, at first, then we started jumping and yelling in backstage. It was amazing feeling. - Can you introduce yourselves? 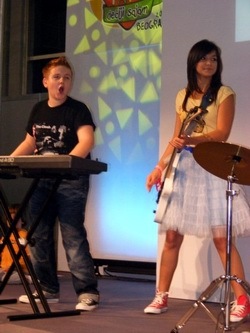 Anica is a singer and her brother Peter is a drum player in a band. They live in Uzice, 200 km away from Belgrade. She is young actress. Peter is, still, a comics fan. Aleksandar, the author and keyboard player, lives in Belgrade. He is an actor, too. 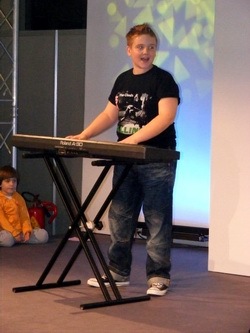 He is composing since age of 8! Una is guitar player. She is from Zrenjanin, some 80 km from capital city. She adores movies and music. Karolina is bass guitar player. 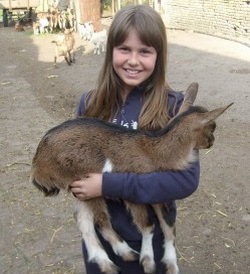 She lives in small town Klek, nearby Zrenjanin. She is Karate master and she won from many tournaments. - For how long have you been acquainted? How the idea to create band appeared? What unites you? 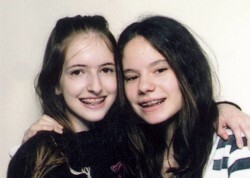 - We met each other long ago, taking part in many Kids music competitions and festivals. Una's father is famous journalist in Serbia and he suggested Aleksander's father, a composer, to give him a help founding a junior band. Everything happened quickly and so spontaneously. What unites us? Friendship and music! We have good time when we are together. And we can not wait for another meeting! - Who created the name of the band, and what meaning you put into it? - NiЕЎta Licno means Nothing Personal in English. It was Aleksander's idea. Aleksander was inspired watching one long and boring political duel on TV, while men were arguing, they started each sentence with вЂњNothin' personal, butвЂ¦вЂќ. He switched off TV, but those two words remained in his mind. There is no particular meaning. - Can you tell us about the story of the song creation? How the idea came to write the song and submit it to the Junior Eurosong? 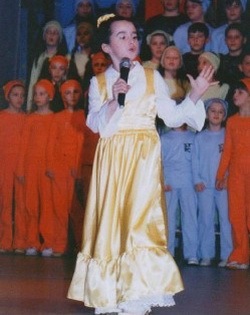 - Aleksander wrote this song two years ago in English for a school event. Title was вЂњHappy New YearвЂќ! 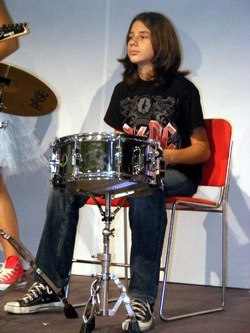 His father encouraged him and said that it was very interesting song, but suggested him to make a Serbian lyrics. 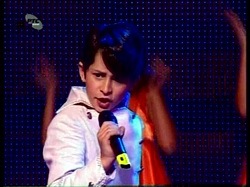 He did it, and everybody momentaly knew that it was perfect for Junior ESC. Anica made few changes in Aleksanders text, bringing a hint of вЂњgirl's sensualityвЂќ in it. - Vocal coach is Suzana, member of "Beauty Queens", Maria Serifovic's back vocal band in ESC 2007. Choreographer is Ziza, very talented and young woman with lot of expirience. - How will you visually present your entry on stage? Will it be similar performance as during Serbian national final, or is there plan to add any visual effects for the international audience to understand better your song? - We were very satisfied with our performance on our finals. Represantatives of our producer and broadcaster, Radio Television of Serbia, were fond too, so they decided not to change a lot. Costumes will be different, of course, but idea stills the same- five cheerful and sweet teenagers on a stage performs a uptempo catchy tune. - Do you plan to record other versions of your entry, in other languages? - We have already recorded an English version and it sounds great! It was not time enough to prepare it in few other languages and we are little bit sad because of it. - Can you tell us, how looks your basic day? What activities do you usually have? How do you like to spend your leisure time? 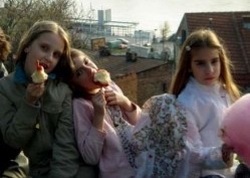 - We enjoy in music, playing games, reading books, spending time with friends. We are constantly engaged with different school activities, and it isn't hard to achive it all. We are sport fans too, specially tennis. We all have pets, dogs, cats, parrots. - We have different fav subjects, but commonly, we like maths and history very much! Musical culture too. 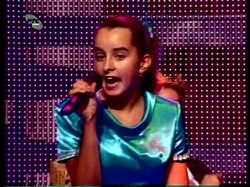 - Have you met any previous Serbian JESC entrants? Any advices they gave to you? - Alexandar and Una, and have you received any advices from your famous relatives Vladimir Graic and Tara Krlic? - Of course! Their comments were useful. And, if you have supporters of such reputation, everything will be much easier for you. 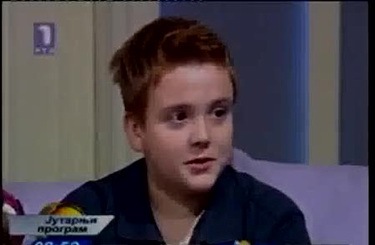 - We are big fans of JESC and we already sing other competing songs. There are many good songs and singers, as well, but we're most impressed with Belgian and Russian entries. - Our aim is to have a good time, to meet boys and girls from other parts of Europe, to show them our good will and positive energy! We can't wait for a departure date! - Anica, the day of Eurovision final is your birthday, are you nervous before the performance and how do you cope with pressure? - Oh, you know about it!? I am not nervous at all! I am happy that I can celebrate my birthday with my friends, old and new. I have numerous entries in kids festivals in past and few theater rolls, so I won't be frightend or even pressed in backstage. At that moment, I usually make jokes with my friends. 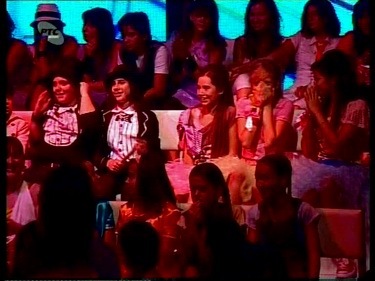 - Karolina and Una, you have already been in Junior Eurovision preselection in 2007, what are your memories from that? - We were two years younger and it was just a childlish game for us. It was fantastic stage and we spent a very good time there. This time, we feel much more responsible, but relaxed, because it's a still kind of game. We are very happy, because we like to travel and visit other countries and meet different cultures and people. - Do you already have some other songs in your band, besides your contest entry? - Aleksandar is in writing process and we expect that he will finish few songs very soon, so we can recorded it and presented it on TV and radio stations. It's crazy moment when you hear your own song on a radio. - What music do you typically like listening to? What are your favourite singers? - We prefer pop and rock music. R'n'B too. Our favorite stars are Beyonce, Katy Perry, Robbie Williams, Avril Lavigne, Miley CyrusвЂ¦ Petar and Anica are into rock, they like Queen and AC/DC. - What are your plans after the contest? Do you want to become professional singers/musiciants in future? - Yes, we would like to, but who knows. It was our childhood dream. We will make a CD and promote it. If we use to all this lights, sound, media interest, maybe. But, we could become nuclear physicist, famous actors, Olimpic winners ? - We send a big kiss to all readers and fans! We would like to thank you for all your comments, critics and support. It means lot to us. - Thank you and see you soon! - РџСЂРёРІРµС‚, РќРёС€С‚Р° Р›РёС‡РЅРѕ! РџРѕР·РґСЂР°РІР»СЏРµРј РІР°СЃ СЃ РїРѕР±РµРґРѕР№ РЅР° РЎРµСЂР±СЃРєРѕРј РЅР°С†РёРѕРЅР°Р»СЊРЅРѕРј РѕС‚Р±РѕСЂРµ! РљР°РєР°СЏ Р±С‹Р»Р° РІР°С€Р° РїРµСЂРІР°СЏ РјС‹СЃР»СЊ, РєРѕРіРґР° РІС‹ РїРѕРЅСЏР»Рё, С‡С‚Рѕ РїРѕР±РµРґРёР»Рё РЅР° СЌС‚РѕРј РєРѕРЅРєСѓСЂСЃРµ? - РЎРїР°СЃРёР±Рѕ! РњС‹ РЅРµ РѕР¶РёРґР°Р»Рё РїРѕР±РµРґС‹, РїРѕСЌС‚РѕРјСѓ РјС‹ Р±С‹Р»Рё РѕС‡РµРЅСЊ СѓРґРёРІР»РµРЅС‹ СЃРЅР°С‡Р°Р»Р°, РїРѕС‚РѕРј РјС‹ РЅР°С‡Р°Р»Рё РїСЂС‹РіР°С‚СЊ Рё РІРёР·Р¶Р°С‚СЊ Р·Р° РєСѓР»РёСЃР°РјРё. Р­С‚Рѕ Р±С‹Р»Рѕ РїРѕС‚СЂСЏСЃР°СЋС‰РµРµ С‡СѓРІСЃС‚РІРѕ. - РџСЂРµРґСЃС‚Р°РІСЊС‚Рµ СЃРµР±СЏ РЅР°С€РёРј С‡РёС‚Р°С‚РµР»СЏРј? - РђРЅРёС†Р° - СЃРѕР»РёСЃС‚РєР° РіСЂСѓРїРїС‹, Р° РµРµ Р±СЂР°С‚ РџРµС‚РµСЂ - СѓРґР°СЂРЅРёРє. РћРЅРё Р¶РёРІСѓС‚ РІ РЈР¶РёС†Рµ, РІ 200 РєРј РѕС‚ Р‘РµР»РіСЂР°РґР°. РћРЅР° - СЋРЅР°СЏ Р°РєС‚СЂРёСЃР°. РџРµС‚РµСЂ, РІСЃРµ РµС‰Рµ, РїРѕРєР»РѕРЅРЅРёРє РєРѕРјРёРєСЃРѕРІ. РђР»РµРєСЃР°РЅРґР°СЂ, Р°РІС‚РѕСЂ РїРµСЃРЅРё Рё РєР»Р°РІРёС€РЅРёРє, Р¶РёРІРµС‚ РІ Р‘РµР»РіСЂР°РґРµ. РћРЅ С‚РѕР¶Рµ Р°РєС‚РµСЂ. РћРЅ РїРёС€РµС‚ РїРµСЃРЅРё СЃ 8 Р»РµС‚! РЈРЅР° - РіРёС‚Р°СЂРёСЃС‚РєР°. РћРЅР° Р¶РёРІРµС‚ РІ Р—СЂРµРЅСЊСЏРЅРёРЅРµ, РІ 80 РєРј РѕС‚ СЃС‚РѕР»РёС†С‹. РћРЅР° РѕР±РѕР¶Р°РµС‚ С„РёР»СЊРјС‹ Рё РјСѓР·С‹РєСѓ. РљР°СЂРѕР»РёРЅР° - Р±Р°СЃ-РіРёС‚Р°СЂРёСЃС‚РєР° РіСЂСѓРїРїС‹. РћРЅР° Р¶РёРІРµС‚ РІ РјР°Р»РµРЅСЊРєРѕРј РіРѕСЂРѕРґРµ РљР»РµРє, СЂСЏРґРѕРј СЃ Р—СЂРµРЅСЊСЏРЅРёРЅРѕРј. РћРЅР° РІР»Р°РґРµРµС‚ РїРѕСЏСЃРѕРј РїРѕ РєР°СЂР°С‚Рµ Рё РІС‹РёРіСЂС‹РІР°Р»Р° РјРЅРѕРіРѕ С‚СѓСЂРЅРёСЂРѕРІР°. - РљР°Рє РґР°РІРЅРѕ РІС‹ Р·РЅР°РєРѕРјС‹? РљР°Рє Рє РІР°Рј РїСЂРёС€Р»Р° РёРґРµСЏ СЃРѕР·РґР°С‚СЊ РіСЂСѓРїРїСѓ? Р§С‚Рѕ РѕР±СЉРµРґРёРЅСЏРµС‚ РІР°СЃ? - РњС‹ Р·РЅР°РєРѕРјС‹ СѓР¶Рµ РѕС‡РµРЅСЊ РґР°РІРЅРѕ, РјС‹ РІРјРµСЃС‚Рµ РїСЂРёРЅРёРјР°Р»Рё СѓС‡Р°СЃС‚РёРµ РІ СЂР°Р·Р»РёС‡РЅС‹С… РґРµС‚СЃРєРёС… РєРѕРЅРєСѓСЂСЃР°РЅС… Рё С„РµСЃС‚РёРІР°Р»СЏС…. РџР°РїР° РЈРЅС‹ - РёР·РІРµСЃС‚РЅС‹Р№ Р¶СѓСЂРЅР°Р»РёСЃС‚ РІ РЎРµСЂР±РёРё, Рё РѕРЅ РїСЂРµРґР»РѕР¶РёР» РїР°РїРµ РђР»РµРєСЃР°РЅРґР°СЂР°, РєРѕРјРїРѕР·РёС‚РѕСЂСѓ, РїРѕРјРѕС‡СЊ РµРјСѓ СЃРѕР·РґР°С‚СЊ РґРµС‚СЃРєСѓСЋ РіСЂСѓРїРїСѓ. Р’СЃРµ РїСЂРѕРёР·РѕС€Р»Рѕ РѕС‡РµРЅСЊ Р±С‹СЃС‚СЂРѕ Рё РѕС‡РµРЅСЊ СЃРїРѕРЅС‚Р°РЅРЅРѕ. Р§С‚Рѕ РѕР±СЉРµРґРёРЅСЏРµС‚ РЅР°СЃ? Р”СЂСѓР¶Р±Р° Рё РјСѓР·С‹РєР°! РњС‹ РѕС‚Р»РёС‡РЅРѕ РїСЂРѕРІРѕРґРёРј РІСЂРµРјСЏ РІРјРµСЃС‚Рµ. Р� РЅРµ РјРѕР¶РµРј РґРѕР¶РґР°С‚СЊСЃСЏ СЃР»РµРґСѓСЋС‰РµР№ РІСЃС‚СЂРµС‡Рё! - РљС‚Рѕ РїСЂРёРґСѓРјР°Р» РЅР°Р·РІР°РЅРёРµ РіСЂСѓРїРїС‹, РєР°РєРѕР№ СЃРјС‹СЃР» РІС‹ РІ РЅРµРіРѕ РІРєР»Р°РґС‹РІР°РµС‚Рµ? - "РќРёС‡РµРіРѕ Р»РёС‡РЅРѕРіРѕ" - СЌС‚Рѕ Р±С‹Р»Р° РёРґРµСЏ РђР»РµРєСЃР°РЅРґР°СЂР°. Р•РіРѕ РІРґРѕС…РЅРѕРІРёР»Рѕ РѕРґРЅРѕ РґР»РёРЅРЅРѕРµ Рё СЃРєСѓС‡РЅРѕРµ РїРѕР»РёС‚РёС‡РµСЃРєРѕРµ С€РѕСѓ РЅР° РўР’, РєРѕРіРґР° РѕРїРїРѕРЅРµРЅС‚С‹ СЃРїРѕСЂРёР»Рё, РѕРЅРё С‡Р°СЃС‚Рѕ РЅР°С‡РёРЅР°Р»Рё СЃ С„СЂР°Р·С‹ "РќРёС‡РµРіРѕ Р»РёС‡РЅРѕРіРѕ, РЅРѕ...". РћРЅ РІС‹РєР»СЋС‡РёР» РўР’, РЅРѕ СЌС‚Рё РґРІР° СЃР»РѕРІР° РѕСЃС‚Р°Р»РёСЃСЊ Сѓ РЅРµРіРѕ РІ РїР°РјСЏС‚Рё. Р’РѕРѕР±С‰Рµ, РјС‹ РЅРµ РїСЂРёРґР°РІР°Р»Рё РЅР°Р·РІР°РЅРёСЋ РєР°РєРѕРіРѕ-С‚Рѕ РѕСЃРѕР±РµРЅРЅРѕРіРѕ Р·РЅР°С‡РµРЅРёСЏ. - Р Р°СЃСЃРєР°Р¶РёС‚Рµ РЅР°Рј, РєР°Рє СЃРѕР·РґР°РІР°Р»Р°СЃСЊ РІР°С€Р° РїРµСЃРЅСЏ. РљР°Рє РїСЂРёС€Р»Р° РёРґРµСЏ РЅР°РїРёСЃР°С‚СЊ РїРµСЃРЅСЋ Рё РѕС‚РїСЂР°РІРёС‚СЊ РµРµ РЅР° Р”РµС‚СЃРєРѕРµ Р•РІСЂРѕРІРёРґРµРЅРёРµ? - РђР»РµРєСЃР°РЅРґР°СЂ РЅР°РїРёСЃР°Р» СЌС‚Сѓ РїРµСЃРЅСЋ РґРІР° РіРѕРґР° РЅР°Р·Р°Рґ РЅР° Р°РЅРіР»РёР№СЃРєРѕРј РґР»СЏ С€РєРѕР»СЊРЅРѕРіРѕ РјРµСЂРѕРїСЂРёСЏС‚РёСЏ. РћРЅР° РЅР°Р·С‹РІР°Р»Р°СЃСЊ "Happy New Year"! Р•РіРѕ РїР°РїР° РїРѕС…РІР°Р»РёР» РµРіРѕ Рё СЃРєР°Р·Р°Р», С‡С‚Рѕ СЌС‚Рѕ РѕС‡РµРЅСЊ С…РѕСЂРѕС€Р°СЏ РїРµСЃРЅСЏ Рё РїРѕСЃРѕРІРµС‚РѕРІР°Р» РЅР°РїРёСЃР°С‚СЊ РЅР° РЅРµРµ СЃРµСЂР±СЃРєРёР№ С‚РµРєСЃС‚. РћРЅ СЃРґРµР»Р°Р» СЌС‚Рѕ Рё С‚РѕРіРґР° РІСЃРµ РїРѕРЅСЏР»Рё, С‡С‚Рѕ РѕРЅР° РѕС‚Р»РёС‡РЅРѕ РїРѕРґС…РѕРґРёС‚ РґР»СЏ Р”РµС‚СЃРєРѕРіРѕ Р•РІСЂРѕРІРёРґРµРЅРёСЏ. РђРЅРёС†Р° РІРЅРµСЃР»Р° РЅРµРјРЅРѕРіРѕ РёР·РјРµРЅРµРЅРёР№ РІ С‚РµРєСЃС‚ РђР»РµРєСЃР°РЅРґР°СЂР°, РґРѕР±Р°РІРёРІ Рє РЅРµРјСѓ "Р¶РµРЅСЃС‚РІРµРЅРЅРѕСЃС‚Рё". - РљС‚Рѕ РІР°С€ РїСЂРµРїРѕРґР°РІР°С‚РµР»СЊ РїРѕ РІРѕРєР°Р»Сѓ Рё С…РѕСЂРµРѕРіСЂР°С„ РІР°С€РµР№ РїРµСЃРЅРё? - РќР°С€ РїРµРґР°РіРѕРі - РЎСЋР·Р°РЅР°, СѓС‡Р°СЃС‚РЅРёС†Р° РіСЂСѓРїРїС‹ "Beauty Queens", РєРѕС‚РѕСЂС‹Рµ Р±С‹Р»Рё РЅР° Р±СЌРє-РІРѕРєР°Р»Рµ Сѓ РњР°СЂРёРё РЁРµСЂРёС„РѕРІРёС‡ РЅР° Р•РІСЂРѕРІРёРґРµРЅРёРё 2007. РќР°С€ С…РѕСЂРµРѕРіСЂР°С„ - Р–РёР¶Р°, РѕС‡РµРЅСЊ С‚Р°Р»Р°РЅС‚Р»РёРІР°СЏ РјРѕР»РѕРґР°СЏ Р¶РµРЅС‰РёРЅР°, РЅРѕ СЃ Р±РѕР»СЊС€РёРј РѕРїС‹С‚РѕРј. - РљР°Рє РІС‹ РІРёР·СѓР°Р»СЊРЅРѕ РїСЂРµРґСЃС‚Р°РІРёС‚Рµ СЃРІРѕСЋ РїРµСЃРЅСЋ РЅР° СЃС†РµРЅРµ? РљР°РєРёРµ Р±СѓРґСѓС‚ РёР·РјРµРЅРµРЅРёСЏ РїРѕ СЃСЂР°РІРЅРµРЅРёСЋ СЃ РЅР°С†РёРѕРЅР°Р»СЊРЅС‹Рј РєРѕРЅРєСѓСЂСЃРЅС‹Рј РѕС‚Р±РѕСЂРѕРј? - РњС‹ Р±С‹Р»Рё РѕС‡РµРЅСЊ РґРѕРІРѕР»СЊРЅС‹ РЅР°С€РёРј РІС‹СЃС‚СѓРїР»РµРЅРёРµРј РЅР° РѕС‚Р±РѕСЂРµ. РџСЂРµРґСЃС‚Р°РІРёС‚РµР»СЏРј РЅР°С€РёС… РїСЂРѕРґСЋСЃРµСЂРѕРІ Рё С‚РµР»РµРєРѕРјРїР°РЅРёРё РѕРЅРѕ С‚РѕР¶Рµ РїРѕРЅСЂР°РІРёР»РѕСЃСЊ, РїРѕСЌС‚РѕРјСѓ РјС‹ СЂРµС€РёР»Рё РјРЅРѕРіРѕ РЅРµ РјРµРЅСЏС‚СЊ. РљРѕСЃС‚СЋРјС‹, РєРѕРЅРµС‡РЅРѕ, Р±СѓРґСѓС‚ РґСЂСѓРіРёРјРё, РЅРѕ, РѕСЃРЅРѕРІРЅР°СЏ РёРґРµСЏ РѕСЃС‚Р°РЅРµС‚СЃСЏ С‚РѕР№ Р¶Рµ, РїРѕРєР°Р·Р°С‚СЊ РїСЏС‚СЊ РІРµСЃРµР»С‹С… РїРѕРґСЂРѕСЃС‚РєРѕРІ РЅР° СЃС†РµРЅРµ, РёСЃРїРѕР»РЅСЏСЋС‰РёС… Р±С‹СЃС‚СЂРѕС‚РµРјРїРѕРІСѓСЋ Р·Р°РїРѕРјРёРЅР°СЋС‰СѓСЋСЃСЏ РїРµСЃРЅСЋ. - Р’С‹ РїР»Р°РЅРёСЂСѓРµС‚Рµ Р·Р°РїРёСЃР°С‚СЊ РґСЂСѓРіРёРµ РІРµСЂСЃРёРё РІР°С€РµР№ РїРµСЃРЅРё, РЅР° РґСЂСѓРіРёС… СЏР·С‹РєР°С…? - Р Р°СЃСЃРєР°Р¶РёС‚Рµ РЅР°Рј, РєР°Рє РІС‹РіР»СЏРґРёС‚ РІР°С€ РѕР±С‹С‡С‹Р№ РґРµРЅСЊ? Р§РµРј РІС‹ РѕР±С‹С‡РЅРѕ Р·Р°РЅРёРјР°РµС‚РµСЃСЊ? - РљР°РєРёРµ РІР°С€Рё Р»СЋР±РёРјС‹Рµ С€РєРѕР»СЊРЅС‹Рµ РїСЂРµРґРјРµС‚С‹? - РћРЅРё Сѓ РЅР°СЃ СЂР°Р·РЅС‹Рµ, РЅРѕ РІ РѕСЃРЅРѕРІРЅРѕРј РЅР°Рј РІСЃРµРј РЅСЂР°РІРёС‚СЃСЏ РјР°С‚РµРјР°С‚РёРєР° Рё РёСЃС‚РѕСЂРёСЏ. Р� РѕСЃРЅРѕРІС‹ РјСѓР·С‹РєР°Р»СЊРЅРѕР№ РєСѓР»СЊС‚СѓСЂС‹. - Р’С‹ РІСЃС‚СЂРµС‡Р°Р»РёСЃСЊ СЃ РїСЂРѕС€Р»С‹РјРё РїСЂРµРґСЃС‚Р°РІРёС‚РµР»СЏРјРё РЎРµСЂР±РёРё РЅР° РєРѕРЅРєСѓСЂСЃРµ? Р”Р°Р»Рё Р»Рё РѕРЅРё РІР°Рј РєР°РєРёРµ-С‚Рѕ СЃРѕРІРµС‚С‹? - РђР»РµРєСЃР°РЅРґР°СЂ Рё РЈРЅР°, РїРѕР»СѓС‡РёР»Рё Р»Рё РІС‹ РєР°РєРёРµ-С‚Рѕ СЃРѕРІРµС‚С‹ РѕС‚ РІР°С€РёС… Р·РЅР°РјРµРЅРёС‚С‹С… СЂРѕРґСЃС‚РІРµРЅРЅРёРєРѕРІ, Р’Р»Р°РґРёРјРёСЂР° Р“СЂР°РёС‡Р° Рё РўР°СЂС‹ РљСЂР»РёС‡? - РљРѕРЅРµС‡РЅРѕ! Р�С… РєРѕРјРјРµРЅС‚Р°СЂРёРё Р±С‹Р»Рё РѕРµРЅСЊ РїРѕР»РµР·РЅС‹. Р�, РµСЃР»Рё Сѓ С‚РµР±СЏ РµСЃС‚СЊ С‚Р°РєРёРµ РёР·РІРµСЃС‚РЅС‹Рµ Р±РѕР»РµР»СЊС‰РёРєРё, С‚Рѕ РґР»СЏ С‚РµР±СЏ С‚РѕР¶Рµ СЃС‚Р°РЅРѕРІРёС‚СЊСЃСЏ Р»РµРіС‡Рµ РґРѕР±РёС‚СЊСЃСЏ СЂРµР·СѓР»СЊС‚Р°С‚Р°. - Р’Р°СЃ РёРЅС‚РµСЂРµСЃСѓРµС‚, РєС‚Рѕ РїСЂРµРґСЃС‚Р°РІРёС‚ РґСЂСѓРіРёРµ СЃС‚СЂР°РЅС‹ РЅР° РєРѕРЅРєСѓСЂСЃРµ, СЃР»СѓС€Р°РµС‚Рµ Р»Рё РІС‹ РїРµСЃРЅРё СѓС‡Р°СЃС‚РЅРёРєРѕРІ РёР· РґСЂСѓРіРёС… СЃС‚СЂР°РЅ? - РњС‹ Р±РѕР»СЊС€РёРµ РїРѕРєР»РѕРЅРЅРёРєРё Р”РµС‚СЃРєРѕРіРѕ Р•РІСЂРѕРІРёРґРµРЅРёСЏ Рё СѓР¶Рµ РјРѕР¶РµРј РґР°Р¶Рµ РїРµС‚СЊ РїРµСЃРЅРё РґСЂСѓРіРёС… СЃС‚СЂР°РЅ. Р’ СЌС‚РѕРј РіРѕРґСѓ РјРЅРѕРіРѕ С…РѕСЂРѕС€РёС… РїРµСЃРµРЅ Рё РїРµРІС†РѕРІ, РЅРѕ РјС‹ Р±РѕР»СЊС€Рµ РІСЃРµРіРѕ РІРїРµС‡Р°С‚Р»РµРЅС‹ РїРµСЃРЅСЏРјРё Р‘РµР»СЊРіРёРё Рё Р РѕСЃСЃРёРё. - РљР°РєРѕРІР° РІР°С€Р° С†РµР»СЊ РЅР° РєРѕРЅРєСѓСЂСЃРµ? Р’С‹ РѕС‚РїСЂР°РІР»СЏРµС‚РµСЃСЊ РЅР° РЅРµРіРѕ Р·Р° РїРѕР±РµРґРѕР№ РёР»Рё РїСЂРѕСЃС‚Рѕ С…РѕСЂРѕС€Рѕ РїСЂРѕРІРµСЃС‚Рё РІСЂРµРјСЏ Рё Р·Р°РІРµСЃС‚Рё РЅРѕРІС‹С… РґСЂСѓР·РµР№? - РќР°С€Р° С†РµР»СЊ - С…РѕСЂРѕС€Рѕ РїСЂРѕРІРµСЃС‚Рё РІСЂРµРјСЏ, РІСЃС‚СЂРµС‚РёС‚СЊ РјР°Р»СЊС‡РёРєРѕРІ Рё РґРµРІРѕС‡РµРє СЃ РґСЂСѓРіРёС… С‡Р°СЃС‚РµР№ Р•РІСЂРѕРїС‹, РѕР±РјРµРЅСЏС‚СЊСЃСЏ СЃ РЅРёРјРё РїРѕР·РёС‚РёРІРЅРѕР№ СЌРЅРµСЂРіРёРµР№! РњС‹ СЃ РЅРµС‚РµСЂРїРµРЅРёРµРј Р¶РґРµРј РґР°С‚С‹ РѕС‚СЉРµР·РґР°! - РђРЅРёС†Р°, Сѓ С‚РµР±СЏ РґРµРЅСЊ СЂРѕР¶РґРµРЅРёСЏ РІ РґРµРЅСЊ С„РёРЅР°Р»Р° Р•РІСЂРѕРІРёРґРµРЅРёСЏ, С‚С‹ РЅРµСЂРІРЅРёС‡Р°РµС€СЊ РїРµСЂРµРґ РІС‹СЃС‚СѓРїР»РµРЅРёРµРј Рё РєР°Рє С‚С‹ СЃРїСЂР°РІР»СЏРµС€СЊСЃСЏ СЃ РЅРµСЂРІР°РјРё? - Рћ, РІС‹ РѕР± СЌС‚РѕРј Р·РЅР°РµС‚Рµ? РќРµС‚, СЏ СЃРѕРІСЃРµРј РЅРµ РЅРµСЂРІРЅРёС‡Р°СЋ! РЇ СЂР°РґР°, С‡С‚Рѕ РјРѕРіСѓ РѕС‚РјРµС‚РёС‚СЊ РґРµРЅСЊ СЂРѕР¶РґРµРЅРёСЏ СЃРѕ СЃРІРѕРёРјРё РґСЂСѓР·СЊСЏРјРё, СЃС‚Р°СЂС‹РјРё Рё РЅРѕРІС‹РјРё. РЇ СѓР¶Рµ РјРЅРѕРіРѕ СЂР°Р· СѓС‡Р°СЃС‚РІРѕРІР°Р»Р° РІ РґРµС‚СЃРєРёС… С„РµСЃС‚РёРІР°Р»СЏС… Рё РІ С‚РµР°С‚СЂР°Р»СЊРЅС‹С… РїРѕСЃС‚Р°РЅРѕРІРєР°С…, РїРѕСЌС‚РѕРјСѓ СЏ РЅРµ Р±РѕСЋСЃСЊ Рё РЅРµ РёСЃРїС‹С‚С‹РІР°СЋ РєР°РєРѕРіРѕ-Р»РёР±Рѕ РїСЂРµСЃСЃРёРЅРіР°. Р’ СЌС‚РѕС‚ РјРѕРјРµРЅС‚, СЏ РѕР±С‹С‡РЅРѕ С€СѓС‡Сѓ СЃ РґСЂСѓР·СЊСЏРјРё. - РљР°СЂРѕР»РёРЅР° Рё РЈРЅР°, РІС‹ РїСЂРёРЅРёРјР°Р»Рё СѓС‡Р°СЃС‚РёРµ РІ РѕС‚Р±РѕСЂРµ РЅР° Р”РµС‚СЃРєРѕРµ Р•РІСЂРѕРІРёРґРµРЅРёРµ РІ 2007, РєР°РєРѕРІС‹ РІР°С€Рё РІРѕСЃРїРѕРјРёРЅР°РЅРёСЏ РѕР± СЌС‚РѕРј? - РњС‹ Р±С‹Р»Рё РЅР° РґРІР° РіРѕРґР° РјР»Р°РґС€Рµ, Рё СЌС‚Рѕ РґР»СЏ РЅР°СЃ Р±С‹Р»Рѕ РґРµС‚СЃРєРѕР№ РёРіСЂРѕР№. РњС‹ РѕС‚Р»РёС‡РЅРѕ РїСЂРѕРІРµР»Рё РІСЂРµРјСЏ. РќР° СЌС‚РѕС‚ СЂР°Р· РјС‹ С‡СѓРІСЃС‚РІСѓРµРј Р±РѕР»СЊС€Рµ РѕС‚РІРµС‚СЃС‚РІРµРЅРЅРѕСЃС‚Рё, РЅРѕ РјС‹ Р±РѕР»РµРµ СЂР°СЃСЃР»Р°Р±Р»РµРЅС‹, РїРѕС‚РѕРјСѓ С‡С‚Рѕ РІСЃРµ СЂР°РІРЅРѕ СЌС‚Рѕ РєР°Рє РёРіСЂР°. РњС‹ РѕС‡РµРЅСЊ СЂР°РґС‹, РїРѕС‚РѕРјСѓ С‡С‚Рѕ РјС‹ Р»СЋР±РёРј РїСѓС‚РµС€РµСЃС‚РІРѕРІР°С‚СЊ Рё РїРѕСЃРµС‰Р°С‚СЊ РґСЂСѓРіРёРµ СЃС‚СЂР°РЅС‹ Рё РІСЃС‚СЂРµС‡Р°С‚СЊСЃСЏ СЃ СЂР°Р·РЅС‹РјРё РЅР°СЂРѕРґР°РјРё Рё РєСѓР»СЊС‚СѓСЂР°РјРё. - РЈ РІР°С€РµР№ РіСЂСѓРїРїС‹ СѓР¶Рµ РµСЃС‚СЊ РєР°РєРёРµ-С‚Рѕ РїРµСЃРЅРё, РїРѕРјРёРјРѕ РєРѕРЅРєСѓСЂСЃРЅРѕР№? - РђР»РµРєСЃР°РЅРґР°СЂ РєР°Рє СЂР°Р· СЃРµР№С‡Р°СЃ СЌС‚РёРј Р·Р°РЅСЏС‚ Рё РјС‹ РѕР¶РёРґР°РµРј, С‡С‚Рѕ РѕРЅ Р·Р°РєРѕРЅС‡РёС‚ РёС… РѕС‡РµРЅСЊ СЃРєРѕСЂРѕ, С‡С‚Рѕ РјС‹ СЃРјРѕР¶РµРј Р·Р°РїРёСЃР°С‚СЊ РёС… Рё РїСЂРµР·РµРЅС‚РѕРІР°С‚СЊ РЅР° РўР’ Рё СЂР°РґРёРѕСЃС‚Р°РЅС†РёСЏС…. Р­С‚Рѕ РѕС‡РµРЅСЊ РєР»Р°СЃСЃРЅРѕ СЃР»С‹С€Р°С‚СЊ СЃРІРѕСЋ РїРµСЃРЅСЋ РЅР° СЂР°РґРёРѕ. - РљР°РєСѓСЋ РјСѓР·С‹РєСѓ РІС‹ РѕР±С‹С‡РЅРѕ СЃР»СѓС€Р°РµС‚СЊ? РљР°РєРёРµ РІР°С€Рё Р»СЋР±РёРјС‹Рµ РёСЃРїРѕР»РЅРёС‚РµР»Рё? - РќР°Рј РЅСЂР°РІРёС‚СЃСЏ РїРѕРї Рё СЂРѕРє-РјСѓР·С‹РєР°, РЅРѕ Рё R'n'B С‚РѕР¶Рµ. РќР°С€Рё РєСѓРјРёСЂС‹ - Р‘РµР№РѕРЅСЃ, РљРµС‚Рё РџРµСЂСЂРё, Р РѕР±Р±Рё РЈРёР»СЊСЏРјСЃ, РђРІСЂРёР» Р›Р°РІРёРЅСЊ, РњРёР»РµР№ РЎР°Р№СЂСѓСЃ... РџРµС‚Р°СЂ Рё РђРЅРёС†Р° Р»СЋР±СЏС‚ СЂРѕРє, РЅР°РїСЂРёРјРµСЂ Queen РёР»Рё AРЎ/DC. - РљР°РєРёРµ Сѓ РІР°СЃ РїР»Р°РЅС‹ РїРѕСЃР»Рµ РљРѕРЅРєСѓСЂСЃР° Р•РІСЂРѕРІРёРґРµРЅРёСЏ? Р’С‹ С…РѕС‚РёС‚Рµ СЃС‚Р°С‚СЊ РїСЂРѕС„РµСЃСЃРёРѕРЅР°Р»СЊРЅС‹РјРё РїРµРІС†Р°РјРё/РјСѓР·С‹РєР°РЅС‚Р°РјРё РІ Р±СѓРґСѓС‰РµРј? - Р”Р°, РјС‹ Р±С‹ С…РѕС‚РµР»Рё Р±С‹, РЅРѕ РєС‚Рѕ Р·РЅР°РµС‚. Р­С‚Рѕ РЅР°С€Р° РґРµС‚СЃРєР°СЏ РјРµС‡С‚Р°. РњС‹ С…РѕС‚РёРј РІС‹РїСѓСЃС‚РёС‚СЊ Р°Р»СЊР±РѕРј Рё РїРѕРїСЂРѕР±РѕРІР°С‚СЊ СЂР°СЃРєСЂСѓС‚РёС‚СЊСЃСЏ. Р•СЃР»Рё РјС‹ РїСЂРёРІС‹РєРЅРµРј Рє СЃРІРµС‚Сѓ, Р·РІСѓРєСѓ, РёРЅС‚РµСЂРµСЃСѓ РїСЂРµСЃСЃС‹, С‚Рѕ РјРѕР¶РµС‚ Р±С‹С‚СЊ РѕСЃС‚Р°РЅРµРјСЃСЏ РІ С€РѕСѓ-Р±РёР·РЅРµСЃРµ. РќРѕ, РїРѕС‡РµРјСѓ Р±С‹ РЅР°Рј РЅРµ СЃС‚Р°С‚СЊ, РЅР°РїСЂРёРјРµСЂ, СЏРґРµСЂРЅС‹РјРё С„РёР·РёРєР°РјРё, РёР·РІРµСЃС‚РЅС‹РјРё Р°РєС‚РµСЂР°РјРё, РѕР»РёРјРїРёР№СЃРєРёРјРё С‡РµРјРїРёРѕРЅР°РјРё? - Р�, РµСЃР»Рё РІР°Рј РµСЃС‚СЊ, С‡С‚Рѕ РґРѕР±Р°РІРёС‚СЊ С‡РёС‚Р°С‚РµР»СЏРј, РІС‹ РјРѕР¶РµС‚Рµ СЌС‚Рѕ СЃРґРµР»Р°С‚СЊ СЃРµР№С‡Р°СЃ. - РњС‹ РїРѕСЃС‹Р»Р°РµРј РІСЃРµРј С‡РёС‚Р°С‚РµР»СЏРј Рё РїРѕРєР»РѕРЅРЅРёРєР°Рј Р±РѕР»СЊС€РѕР№ РІРѕР·РґСѓС€РЅС‹Р№ РїРѕС†РµР»СѓР№! РЎРїР°СЃРёР±Рѕ Р·Р° РІР°С€Рё РєРѕРјРјРµРЅС‚Р°СЂРёРё, РєСЂРёС‚РёРєСѓ Рё РїРѕРґРґРµСЂР¶РєСѓ! Р­С‚Рѕ РјРЅРѕРіРѕ РґР»СЏ РЅР°СЃ Р·РЅР°С‡РёС‚! - РЎРїР°СЃРёР±Рѕ Р·Р° РёРЅС‚РµСЂРІСЊСЋ Рё СѓРІРёРґРёРјСЃСЏ РЅР° Р•РІСЂРѕРЅРµРґРµР»Рµ! 12/11 RTS Serbia: "We reserve the right to decide on the day of departure to Kiev to cancel the trip, if parents of participatin children will decide so", says the statement spread by the national broadcaster. In it, it is mentioned that on the day of departure parents of all participants will have to sign their agreement to let children take part in the contest in Kiev. For several weeks, RTS is in intensive, daily contact with the European Broadcasting Union and officially asked the Council of the Ministry of Health of the Republic of Serbia and parents of children of participants for their decision. 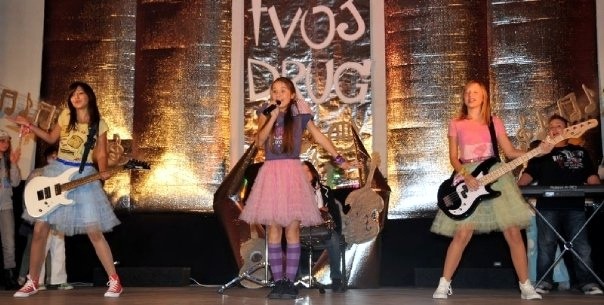 At this moment, parents unanimously agree that children have to proceed with the performance in JESC 2009. To date, no country has canceled participation, however, all the countries have expressed their worries on the situation in Ukraine. Update 13/11: "Ukraine has given guarantees that the competition will be held at the highest level of safety and health protection", said head of Serbian delegation Marija Kovac. All emergency measures, including antiviral drugs and Epidemiological masks will be used. "Parents of children aged 11 to 15 years, gave written consent," Kovac said, adding that the children will be escorted 24 hours a day and that both hotel, where delegations will be located, and the Arena will declared special areas. State Secretary for the Diaspora Miodrag Jaksic has met Serbian representatives and handed them the flag of Serbia, wishing to achieve a good result and make new friends. "The Ministry intends to invite our people in diaspora to vote for our representatives," Jaksic said. Р РўРЎ РЎРµСЂР±РёСЏ: "РњС‹ РѕСЃС‚Р°РІР»СЏРµРј Р·Р° СЃРѕР±РѕР№ РїСЂР°РІРѕ РѕРїСЂРµРґРµР»РёС‚СЊ РІ РїР»Р°РЅРёСЂСѓРµРјС‹Р№ РґРµРЅСЊ РІС‹Р»РµС‚Р°, РѕС‚РїСЂР°РІР»СЏС‚СЊ Р»Рё РЅР°Рј РґРµР»РµРіР°С†РёСЋ РЅР° РєРѕРЅРєСѓСЂСЃ, РёР»Рё РѕС‚РјРµРЅСЏС‚СЊ РЅР°С€Рµ СѓС‡Р°СЃС‚РёРµ, РµСЃР»Рё С‚Р°РєРѕРµ РјРЅРµРЅРёРµ РІС‹СЃРєР°Р¶СѓС‚ СЂРѕРґРёС‚РµР»Рё РёСЃРїРѕР»РЅРёС‚РµР»РµР№", РіРѕРІРѕСЂРёС‚СЃСЏ РІ Р·Р°СЏРІР»РµРЅРёРё С‚РµР»РµРєРѕРјРїР°РЅРёРё. Р’ РЅРµРј С‚Р°РєР¶Рµ РѕС‚РјРµС‡РµРЅРѕ, С‡С‚Рѕ СЂРѕРґРёС‚РµР»Рё Р±СѓРґСѓС‚ РґРѕР»Р¶РЅС‹ РІ РґРµРЅСЊ РѕС‚Р»РµС‚Р° РїРёСЃСЊРјРµРЅРЅРѕ РІС‹СЂР°Р·РёС‚СЊ СЃРѕРіР»Р°СЃРёРµ СЃ СѓС‡Р°СЃС‚РёРµРј РёС… РґРµС‚РµР№ РІ РєРѕРЅРєСѓСЂСЃРµ РІ РљРёРµРІРµ. РЈР¶Рµ РЅРµСЃРєРѕР»СЊРєРѕ РЅРµРґРµР»СЊ С‚РµР»РµРєР°РЅР°Р» Р РўРЎ РЅР°С…РѕРґРёС‚СЃСЏ РІ РёРЅС‚РµРЅСЃРёРІРЅРѕРј, РµР¶РµРґРЅРµРІРЅРѕРј РєРѕРЅС‚Р°РєС‚Рµ СЃ Р•РІСЂРѕРїРµР№СЃРєРёРј Р’РµС‰Р°С‚РµР»СЊРЅС‹Рј РЎРѕСЋР·РѕРј Рё Р·Р°РїСЂРѕСЃРёР» РѕС„РёС†РёР°Р»СЊРЅРѕРіРѕ РѕС‚Р·С‹РІР° РѕС‚ РњРёРЅРёСЃС‚РµСЂСЃС‚РІР° Р—РґСЂР°РІРѕРѕС…СЂР°РЅРµРЅРёСЏ РЎРµСЂР±РёРё Рё СЂРѕРґРёС‚РµР»Р№ СѓС‡Р°СЃС‚РЅРёРєРѕРІ. РќР° СЃРµРіРѕРґРЅСЏС€РЅРёР№ РјРѕРјРµРЅС‚, РІСЃРµ СЂРѕРґРёС‚РµР»Рё РєРѕРЅРєСѓСЂР°РЅС‚РѕРІ СЃРѕРіР»Р°СЃРЅС‹, С‡С‚РѕР±С‹ РёС… РґРµС‚Рё РїСЂРѕРґРѕР»Р¶РёР»Рё СѓС‡Р°СЃС‚РёРµ РІ РєРѕРЅРєСѓСЂСЃРµ. РќР° СЃРµРіРѕРґРЅСЏ, РЅРё РѕРґРЅР° СЃС‚СЂР°РЅР° РЅРµ РѕС‚РєР°Р·Р°Р»Р°СЃСЊ РѕС‚ РїРѕРµР·РґРєРё РІ РљРёРµРІ, РѕРґРЅР°РєРѕ, РІСЃРµ РѕРЅРё РІС‹СЂР°Р·РёР»Рё СЃРІРѕРё РѕРїР°СЃРµРЅРёСЏ, РІ СЃРІСЏР·Рё СЃ СЃРёС‚СѓР°С†РёРµР№ РЅР° РЈРєСЂР°РёРЅРµ. РћР±РЅРѕРІР»РµРЅРёРµ: "РЈРєСЂР°РёРЅР° РґР°Р»Р° РіР°СЂР°РЅС‚РёРё С‚РѕРіРѕ, С‡С‚Рѕ РєРѕРЅРєСѓСЂСЃ Р±СѓРґРµС‚ РїСЂРѕРІРµРґРµРЅ РЅР° РІС‹СЃС€РµРј СѓСЂРѕРІРЅРµ Р±РµР·РѕРїР°СЃС‚РЅРѕСЃС‚Рё Рё РѕС…СЂР°РЅС‹ Р·РґРѕСЂРѕРІСЊСЏ", Р·Р°СЏРІРёР»Р° РіР»Р°РІР° РґРµР»РµРіР°С†РёРё РЎРµСЂР±РёРё РњР°СЂРёСЏ РљРѕРІР°С‡. Р’СЃРµ С‡СЂРµР·РІС‹С‡Р°Р№РЅС‹Рµ РјРµСЂС‹, РІРєР»СЋС‡Р°СЏ Р°РЅС‚РёРІРёСЂСѓСЃРЅС‹Рµ Р»РµРєР°СЂСЃС‚РІР° Рё СЌРїРёРґРµРјРёРѕР»РѕРіРёС‡РµСЃРєРёРµ РјР°СЃРєРё, Р±СѓРґСѓС‚ РёСЃРїРѕР»СЊР·РѕРІР°РЅС‹. "Р РѕРґРёС‚РµР»Рё РґРµС‚РµР№ РІ РІРѕР·СЂР°СЃС‚Рµ РѕС‚ 11 РґРѕ 15 Р»РµС‚ РґР°Р»Рё РїРёСЃСЊРјРµРЅРЅРѕРµ СЃРѕРіР»Р°СЃРёРµ", СЃРєР°Р·Р°Р»Р° РљРѕРІР°С‡ Рё РґРѕР±Р°РІРёР»Р°, С‡С‚Рѕ Р·Р° РґРµС‚СЊРјРё Р±СѓРґСѓС‚ СЃР»РµРґРёС‚СЊ 24 С‡Р°СЃР° РІ РґРµРЅСЊ, Рё С‡С‚Рѕ РѕС‚РµР»СЊ, РІ РєРѕС‚РѕСЂРѕРј Р±СѓРґСѓС‚ РїСЂРѕР¶РёРІР°С‚СЊ РґРµР»РµРіР°С†РёРё Рё РђСЂРµРЅР° РєРѕРЅРєСѓСЂСЃР° Р±СѓРґСѓС‚ РѕР±СЉСЏРІР»РµРЅС‹ СЃРїРµС†РёР°Р»СЊРЅС‹РјРё Р·РѕРЅР°РјРё. Р“РѕСЃСѓРґР°СЂСЃС‚РІРµРЅРЅС‹Р№ СЃРµРєСЂРµС‚Р°СЂСЊ РїРѕ РІРѕРїСЂРѕСЃР°Рј Р”РёР°СЃРїРѕСЂС‹ РњРёРѕРґСЂР°Рі РЇРєС€РёС‡ РІСЃС‚СЂРµС‚РёР»СЃСЏ СЃ РїСЂРµРґСЃС‚Р°РІРёС‚РµР»СЏРјРё РЎРµСЂР±РёРё Рё РІСЂСѓС‡РёР» РёРј СЃРµСЂР±СЃРєРёР№ С„Р»Р°Рі, РїРѕР¶РµР»Р°РІ РґРѕСЃС‚РёС‡СЊ С…РѕСЂРѕС€РµРіРѕ СЂРµР·СѓР»СЊС‚Р°С‚Р° Рё Р·Р°РІРµСЃС‚Рё РЅРѕРІС‹С… РґСЂСѓР·РµР№. "РњРёРЅРёСЃС‚РµСЂСЃС‚РІРѕ РїРѕРїСЂРѕСЃРёС‚ РїСЂРµРґСЃС‚Р°РІРёС‚РµР»РµР№ СЃРµСЂР±СЃРєРѕР№ РґРёР°СЃРїРѕСЂС‹ Р·Р°СЂСѓР±РµР¶РѕРј РїРѕРґРґРµСЂР¶Р°С‚СЊ РЅР°С€РёС… РїСЂРµРґСЃС‚Р°РІРёС‚РµР»РµР№", РґРѕР±Р°РІРёР» РЇРєС€РёС‡. 16/10 Today, Serbian entrants, band "Nista Licno" will performe as guests of the Pozega International Children's Festival "Ja sam tvoj drug". Vladimir Graic, father of Sasa Graic will also be guest of the festival. РЎРµРіРѕРґРЅСЏ, РїСЂРµРґСЃС‚Р°РІРёС‚РµР»Рё РЎРµСЂР±РёРё РіСЂСѓРїРїР° "РќРёС€С‚Рѕ Р»РёС‡РЅРѕ" РІС‹СЃС‚СѓРїРёС‚ РІ РєР°С‡РµСЃС‚РІРµ РіРѕСЃС‚РµР№ РЅР° РјРµР¶РґСѓРЅР°СЂРѕРґРЅРѕРј РґРµС‚СЃРєРѕРј С„РµСЃС‚РёРІР°Р»Рµ "РЇ - С‚РІРѕР№ РґСЂСѓРі" РІ РџРѕР¶РµРіРµ. РћС‚РµС† РЎР°С€Рё Р“СЂР°РёС‡Р°, Р’Р»Р°РґРёРјРёСЂ Р“СЂР°РёС‡, С‚Р°РєР¶Рµ Р±СѓРґРµС‚ РіРѕСЃС‚РµРј С„РµСЃС‚РёРІР°Р»СЏ. 16/09 Serbia is the third country to change the date of national preselection during this week. Please, pay attention that national preselection of Serbia as well as national preselection in Romania have been rescheduled from 20th to 19th of September, while national preselection of Georgia from 27th to 26th of September. The latest correct dates are always available on the calender on top of the page. It is unclear at the moment, when RTS Sat will broadcast the national final, in schedule it is set for 20th of September, 13.30 local time. Update: timetables changed, RTS Sat is also set to broadcast NF live. РЎРµСЂР±РёСЏ - С‚СЂРµС‚СЊСЏ СЃС‚СЂР°РЅР° Р·Р° РЅРµРґРµР»СЋ, РєРѕС‚РѕСЂР°СЏ СЂРµС€РёР»Р° СЃРјРµРЅРёС‚СЊ РґР°С‚Сѓ С„РёРЅР°Р»Р° РЅР°С†РёРѕРЅР°Р»СЊРЅРѕРіРѕ РѕС‚Р±РѕСЂР°. РћР±СЂР°С‚РёС‚Рµ РІРЅРёРјР°РЅРёРµ, С‡С‚Рѕ СЃРµСЂР±СЃРєРёР№ Рё СЂСѓРјС‹РЅСЃРєРёР№ РѕС‚Р±РѕСЂС‹ РїРµСЂРµРЅРµСЃРµРЅС‹ СЃ 20РіРѕ РЅР° 19Рµ СЃРµРЅС‚СЏР±СЂСЏ, Р° РіСЂСѓР·РёРЅСЃРєРёР№ РѕС‚Р±РѕСЂ СЃ 27РіРѕ РЅР° 26Рµ СЃРµРЅС‚СЏР±СЂСЏ. РўРѕС‡РЅС‹Рµ РґР°С‚С‹ С„РёРЅР°Р»РѕРІ РІС‹ РІСЃРµРіРґР° РјРѕР¶РµС‚Рµ РЅР°Р№С‚Рё РІ РєР°Р»РµРЅРґР°СЂРµ РЅР°РІРµСЂС…Сѓ СЃС‚СЂР°РЅРёС†С‹. РџРѕРєР° РЅРµРїРѕРЅСЏС‚РЅРѕ, РєРѕРіРґР° С„РёРЅР°Р» РЅР°С†РёРѕРЅР°Р»СЊРЅРѕРіРѕ РѕС‚Р±РѕСЂР° Р±СѓРґРµС‚ РїРѕРєР°Р·Р°РЅ RTS Sat, РІ РїСЂРѕРіСЂР°РјРјРµ РїРѕРєР° РѕРЅ Р·РЅР°С‡РёС‚СЃСЏ 20РіРѕ СЃРµРЅС‚СЏР±СЂСЏ РІ 13.30 РјРµСЃС‚РЅРѕРіРѕ РІСЂРµРјРµРЅРё. РћР±РЅРѕРІР»РµРЅРёРµ: РїСЂРѕРіСЂР°РјРјР° РёР·РјРµРЅРµРЅР°, RTS Sat С‚Р°РєР¶Рµ РїРѕРєР°Р¶РµС‚ С„РёРЅР°Р» РІ РїСЂСЏРјРѕРј СЌС„РёСЂРµ. 09/09 At the press-conference of channel RTS held today, last year representative of Serbia, Maja MaziД‡, has determined draw of running order at Serbian "DeДЌja pesma Evrovizije". Participants of the press-conference were DuЕЎka VuДЌiniД‡ LuДЌiД‡, PR manager of RTS, Marija KovaДЌ, head of delegation at JESC and Dragoljub IliД‡, editor of the broadcast. As earlier reported by ESCKaz, national final will be broadcasted on RTS 1 on 20th of September at 12.00, hosted by Kristina RadenkoviД‡ i Miki DamjanoviД‡. Winner will be selected by televoting and jury voting. 1. Marija Ugrica: "Hajde da sanjamo"
2. Nastasja Е koriД‡ StaЕЎa: "Duh"
4. Hana i Lana: "Budi svoj"
6. Angelina i Jelisaveta: "Sestrice"
7. 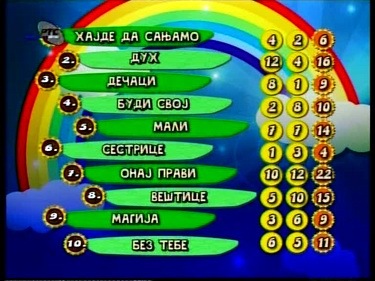 "NiЕЎta liДЌno": "Onaj pravi"
10. Jelena Krvavac: "Bez tebe" РќР° РїСЂРµСЃСЃ- РєРѕРЅС„РµСЂРµРЅС†РёРё, РїСЂРѕРІРµРґРµРЅРЅРѕР№ СЃРµРіРѕРґРЅСЏ С‚РµР»РµРєР°РЅР°Р»РѕРј Р РўРЎ РїСЂРµРґСЃС‚Р°РІРёС‚РµР»СЊРЅРёС†Р° РЎРµСЂР±РёРё РїСЂРѕС€Р»РѕРіРѕ РіРѕРґР° РњР°Р№СЏ РњР°Р·РёС‡ РѕРїСЂРµРґРµР»РёР»Р° РїРѕСЂСЏРґРѕРє РІС‹СЃС‚СѓРїР»РµРЅРёСЏ РЅР° РЅР°С†РёРѕРЅР°Р»СЊРЅРѕРј РѕС‚Р±РѕСЂРµ. РќР° РїСЂРµСЃСЃ-РєРѕРЅС„РµСЂРµРЅС†РёРё РїСЂРёСЃСѓС‚СЃС‚РІРѕРІР°Р»Рё С‚Р°РєР¶Рµ Р”СѓС€РєР° Р’СѓС‡РёРЅРёС‡ Р›СЋС‡РёС‡, PR РјРµРЅРµРґР¶РµСЂ С‚РµР»РµРєР°РЅР°Р»Р° Р РўРЎ, РњР°СЂРёСЏ РљРѕРІР°С‡, РіР»Р°РІР° РґРµР»РµРіР°С†РёРё РЅР° Р”РµС‚СЃРєРѕРј Р•РІСЂРѕРІРёРґРµРЅРёРё Рё Р”СЂР°РіРѕР»СЋР± Р�Р»РёС‡, СЂРµР¶РёСЃСЃРµСЂ СЌС„РёСЂР°. РљР°Рє СЂР°РЅРµРµ СЃРѕРѕР±С‰Р°Р» ESCKaz, РЅР°С†РёРѕРЅР°Р»СЊРЅС‹Р№ С„РёРЅР°Р» Р±СѓРґРµС‚ РїРѕРєР°Р·Р°РЅ РЅР° Р РўРЎ 1 20РіРѕ СЃРµРЅС‚СЏР±СЂСЏ РІ 12.00, РїСЂРѕРІРµРґСѓС‚ РµРіРѕ РљСЂРёСЃС‚РёРЅР° Р Р°РґРµРЅРєРѕРІРёС‡ Рё РњРёРєРё Р”Р°РјСЊСЏРЅРѕРІРёС‡. РџРѕР±РµРґРёС‚РµР»СЊ Р±СѓРґРµС‚ РІС‹Р±СЂР°РЅ СЃРѕРІРјРµСЃС‚РЅС‹Рј СЂРµС€РµРЅРёРµРј Р·СЂРёС‚РµР»РµР№ Рё Р¶СЋСЂРё. 1. РњР°СЂРёСЏ РЈРіСЂРёС†Р°: "РҐР°Р№РґРµ РґР° СЃР°РЅСЊР°РјРѕ"
2. РќР°СЃС‚Р°СЃСЊСЏ РЁРєРѕСЂРёС‡ РЎС‚Р°С€Р°: "Р”СѓС…"
4. РҐР°РЅР° Рё Р›Р°РЅР°: "Р‘СѓРґРё СЃРІРѕР№"
6. РђРЅРіРµР»РёРЅР° Рё Р•Р»РёСЃР°РІРµС‚Р°: "РЎРµСЃС‚СЂРёС†Рµ"
7. "РќРёС€С‚Р° Р»РёС‡РЅРѕ": "РћРЅР°Р№ РїСЂР°РІРё"
10. Р•Р»РµРЅР° РљСЂРІР°РІР°С†: "Р‘РµР· С‚РµР±Рµ"
07/09 Serbian broadcaster RTS has published today 1 minute extracts of audio files of the entries taking part in the national preselection, that has been set for September 20th. They can be heard here. During this week, participants of the preselection will be appearing in Jutarni Program on RTS. РўРµР»РµРІРёРґРµРЅРёРµ РЎРµСЂР±РёРё РѕРїСѓР±Р»РёРєРѕРІР°Р»Рѕ 1-РјРёРЅСѓС‚РЅС‹Рµ РѕС‚СЂС‹РІРєРё Р°СѓРґРёРѕР·Р°РїРёСЃРµР№ РїРµСЃРµРЅ, РїСЂРёРЅРёРјР°СЋС‰РёС… СѓС‡Р°СЃС‚РёРµ РІ РЅР°С†РёРѕРЅР°Р»СЊРЅРѕРј РѕС‚Р±РѕСЂРµ, РЅР°Р·РЅР°С‡РµРЅРЅРѕРј РЅР° 20 СЃРµРЅС‚СЏР±СЂСЏ. РџСЂРѕСЃР»СѓС€Р°С‚СЊ РёС… РјРѕР¶РЅРѕ Р·РґРµСЃСЊ. РќР° СЌС‚РѕР№ РЅРµРґРµР»Рµ РєРѕРЅРєСѓСЂСЃР°РЅС‚С‹ РѕС‚Р±РѕСЂР° Р±СѓРґСѓС‚ РїСЂРёРЅРёРјР°С‚СЊ СѓС‡Р°СЃС‚РёРµ РІ Jutarni Program РЅР° RTS. 04/09 Final of national Serbian preselection for Junior Eurovision 2009 DeДЌja Pesma Evrovizije has been set for 20th of September and it will be held in the studio 9 of Radio Television Serbia in KoЕЎutnjak. Hosts of this prestigious music competition will be young hostess of RTS programs Kristina RadenkoviД‡ and actor Miki DamjanoviД‡, known for his role of secret agent Izi. - When I received the proposal to host this popular competition I had no second thoughts, but just immediately accepted this position. I love this project and enjoy communication with they younger audience, told Miki to Serbian press. Р¤РёРЅР°Р» РЅР°С†РёРѕРЅР°Р»СЊРЅРѕРіРѕ СЃРµСЂР±СЃРєРѕРіРѕ РѕС‚Р±РѕСЂР° РЅР° Р”РµС‚СЃРєРѕРµ Р•РІСЂРѕРІРёРґРµРЅРёРµ 2009 РЅР°Р·РЅР°С‡РµРЅ РЅР° 20 СЃРµРЅС‚СЏР±СЂСЏ, РѕРЅ РїСЂРѕР№РґРµС‚ РІ СЃС‚СѓРґРёРё 9 СЃРµСЂР±СЃРєРѕРіРѕ С‚РµР»РµРІРёРґРµРЅРёСЏ РІ РљРѕС€СѓС‚РЅСЏРєРµ. Р’РµРґСѓС‰РёРјРё СЌС‚РѕРіРѕ РїСЂРµСЃС‚РёР¶РЅРѕРіРѕ РјСѓР·С‹РєР°Р»СЊРЅРѕРіРѕ СЃРѕСЂРµРІРЅРѕРІР°РЅРёСЏ СЃС‚Р°РЅСѓС‚ РјРѕР»РѕРґР°СЏ РІРµРґСѓС‰Р°СЏ РїСЂРѕРіСЂР°РјРј С‚РµР»РµРІРёРґРµРЅРёСЏ РЎРµСЂР±РёРё РљСЂРёСЃС‚РёРЅР° Р Р°РґРµРЅРєРѕРІРёС‡ Рё Р°РєС‚РµСЂ РњРёРєРё Р”Р°РјСЊСЏРЅРѕРІРёС‡, РёР·РІРµСЃС‚РЅС‹Р№ РїРѕ СЃРІРѕРµР№ СЂРѕР»Рё СЃРµРєСЂРµС‚РЅРѕРіРѕ Р°РіРµРЅС‚Р° Р�Р·Рё. - РљРѕРіРґР° СЏ РїРѕР»СѓС‡РёР» РїСЂРµРґР»РѕР¶РµРЅРёРµ РїСЂРѕРІРµСЃС‚Рё СЌС‚РѕС‚ РїРѕРїСѓР»СЏСЂРЅС‹Р№ РєРѕРЅРєСѓСЂСЃ, СЏ РґРѕР»РіРѕ РЅРµ СЂР°Р·РґСѓРјС‹РІР°Р», Р° СЃСЂР°Р·Сѓ РѕС‚РІРµС‚РёР» СЃРѕРіР»Р°СЃРёРµРј. РњРЅРµ РѕС‡РµРЅСЊ РЅСЂР°РІРёС‚СЃСЏ СЌС‚РѕС‚ РїСЂРѕРµРєС‚ Рё СЏ Р»СЋР±Р»СЋ РѕР±С‰Р°С‚СЊСЃСЏ СЃ РјРѕР»РѕРґРѕР№ Р°СѓРґРёС‚РѕСЂРёРµР№, СЂР°СЃСЃРєР°Р·Р°Р» РњРёРєРё СЃРµСЂР±СЃРєРѕР№ РїСЂРµСЃСЃРµ. РњР°СЂРёСЏ РЈРіСЂРёС†Р° СѓР¶Рµ РїСЂРёРЅРёРјР°Р»Р° СѓС‡Р°СЃС‚РёРµ РІ РѕС‚Р±РѕСЂР°С… 2005 Рё 2008, Р­РјРёР»РёСЏ РњР°СЂРєРѕРІРёС‡ - РІ РѕС‚Р±РѕСЂРµ 2008 РіРѕРґР°, Р° Р�СЃРёРґРѕСЂР° РћС‚Р°С€РµРІРёС‡ РІ 2007. РЎС‚Р°С€Р° - РїСЂРµРґСЃС‚Р°РІРёС‚РµР»СЊРЅРёС†Р° РЎРµСЂР±РёРё РЅР° С„РµСЃС‚РёРІР°Р»Рµ "РЎР»Р°РІСЏРЅСЃРєРёР№ Р‘Р°Р·Р°СЂ" РІ СЌС‚РѕРј РіРѕРґСѓ. РЎ Р±РёРѕРіСЂР°С„РёСЏРјРё СѓС‡Р°СЃС‚РЅРёРєРѕРІ (РЅР° РЎРµСЂР±СЃРєРѕРј) РІС‹ РјРѕР¶РµС‚Рµ РѕР·РЅР°РєРѕРјРёС‚СЊСЃСЏ Р·РґРµСЃСЊ. 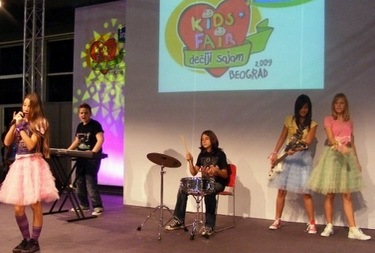 05/06 Serbian national broadcaster RTS has announced launch of preselection period for Junior Eurovision 2009. The entries can be submitted till 5th of July and complete regulations are available on RTS website here. Exact details on when and how national final will be held will be announced later. РЎРµСЂР±СЃРєР°СЏ РЅР°С†РёРѕРЅР°Р»СЊРЅР°СЏ С‚РµР»РµРєРѕРјРїР°РЅРёСЏ Р РўРЎ РЅР°С‡Р°Р»Р° РїСЂРёРµРј Р·Р°СЏРІРѕРє РЅР° СѓС‡Р°СЃС‚РёРµ РІ Р”РµС‚СЃРєРѕРј Р•РІСЂРѕРІРёРґРµРЅРёРё 2009. Р�С… Р±СѓРґСѓС‚ РїСЂРёРЅРёРјР°С‚СЊ РґРѕ 5РіРѕ РёСЋР»СЏ, СЃ РїРѕР»РЅС‹Рј С‚РµРєСЃС‚РѕРј РїСЂР°РІРёР» РєРѕРЅРєСѓСЂСЃР° РІС‹ РјРѕР¶РµС‚Рµ РѕР·РЅР°РєРѕРјРёС‚СЊСЃСЏ Р·РґРµСЃСЊ. Р�РЅС„РѕСЂРјР°С†РёСЏ Рѕ С‚РѕРј РєРѕРіРґР° Рё РІ РєР°РєРѕР№ С„РѕСЂРјРµ РїСЂРѕР№РґРµС‚ РЅР°С†РёРѕРЅР°Р»СЊРЅС‹Р№ РѕС‚Р±РѕСЂ Р±СѓРґРµС‚ РѕР±СЉСЏРІР»РµРЅР° РїРѕР·РґРЅРµРµ.